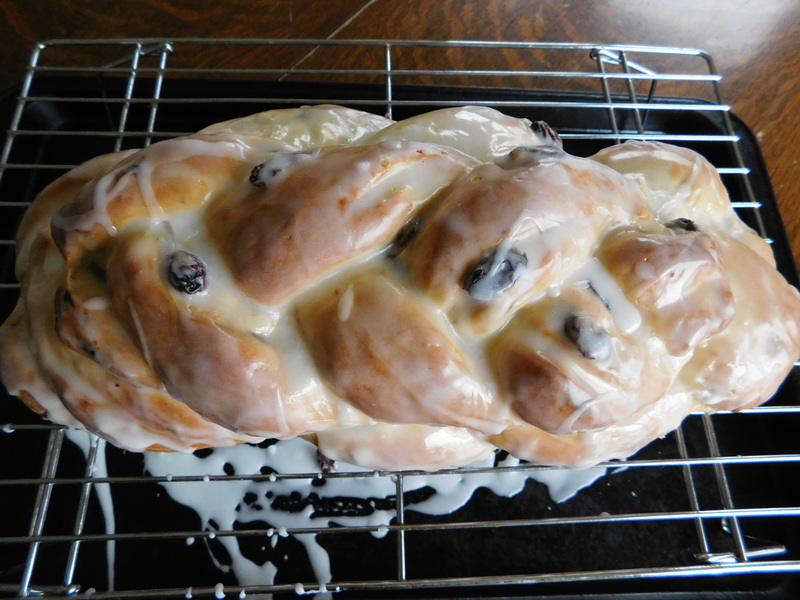 This recipe for Easter Braid comes from the same cookbook that has the Hopping Bunny Rolls recipe in it. It was the Better Homes & Gardens Holiday Cookbook copyright 1970 that I got for my 12th birthday, and I’ve been using the holiday recipes in that book ever since. I make the Hopping Bunny Rolls every year – it’s now a family tradition – but I have never tried this Easter Braid. Mostly because I always make the Hopping Bunny Rolls, and we don’t need more sweet bread. Well, maybe just the two kinds. There may be a new tradition in my future. 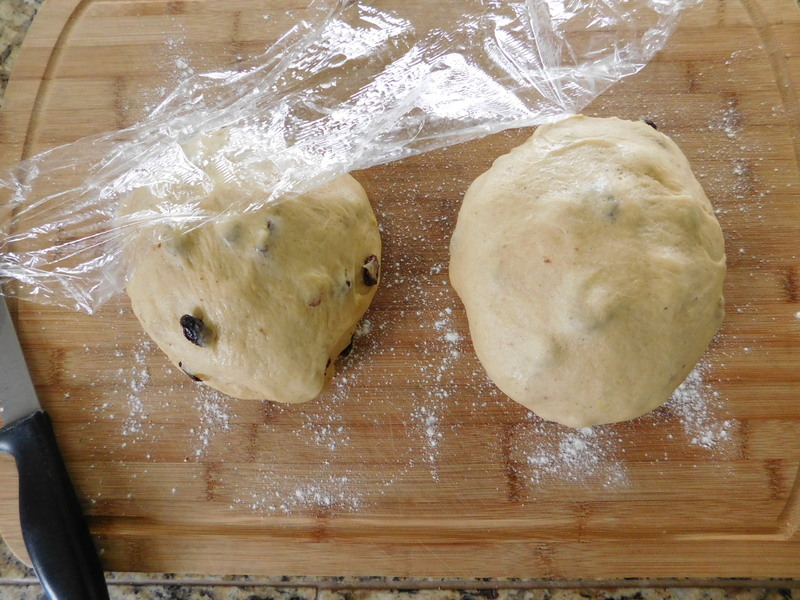 Oops – I forgot the third kind of sweet bread – Hot Crossed Buns. The more the merrier, I guess. I’m so glad I tried this bread. 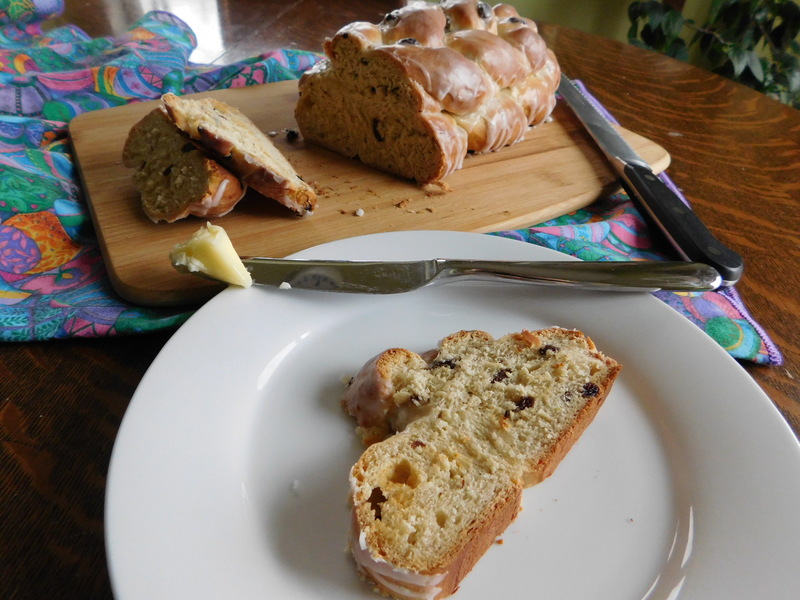 It kind of tastes like a Christmas bread, only strangely more like a spring time sweet bread. It must be the lemon rind that’s put in it. Whatever. I’m not going to over-analyze it, I’m just going to enjoy it. This is an all day recipe – it takes some time, but it’s totally worth it! 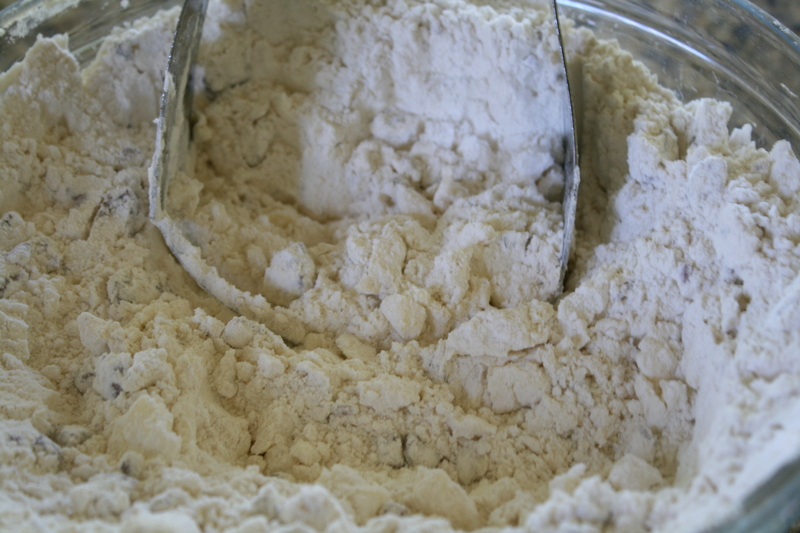 Knead on lightly floured surface until smooth and elastic. Place in lightly greased bowl, turning once to grease surface. Cover and let rise in a warm place until double (about 1 1/2 hours). Punch down; let rise until almost double (about 1 hour). 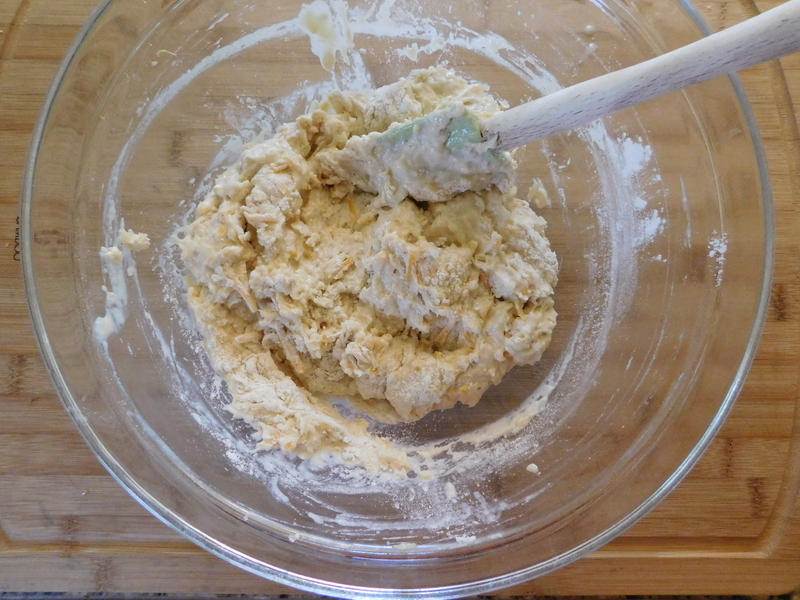 Divide and round dough into 2 balls, one for each loaf. Let rest, covered, 10 minutes. Shape 3 parts into strands 12 inches long, tapering ends. Line up strands 1 inch apart on lightly greased baking sheet. 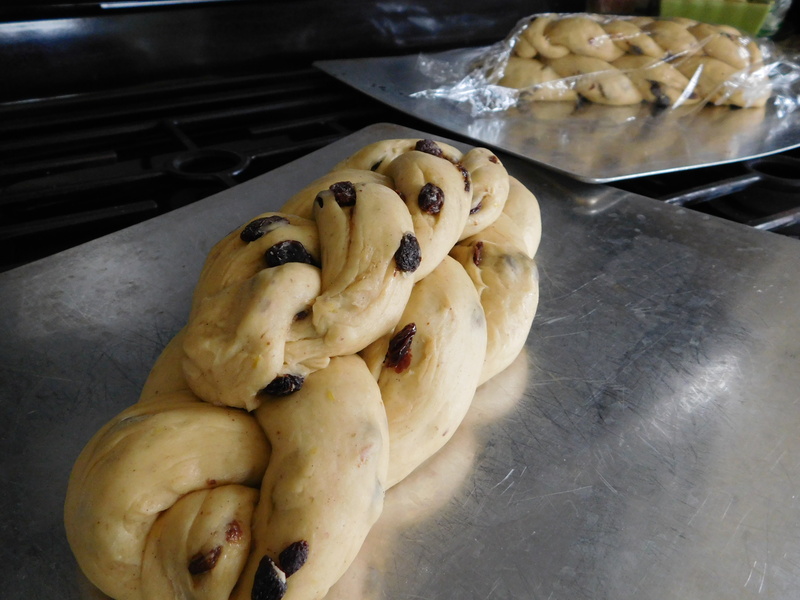 Braid loosely without stretching dough, beginning in the middle and working toward either end. Divide remaining dough into thirds. Shape into strands 8-9 inches long, tapering ends. Braid loosely and place on top of large braid, tucking ends of small braid into large one. Bake loaves at 350 degrees for 25-30 minutes. While warm, spread with Sugar Glaze. 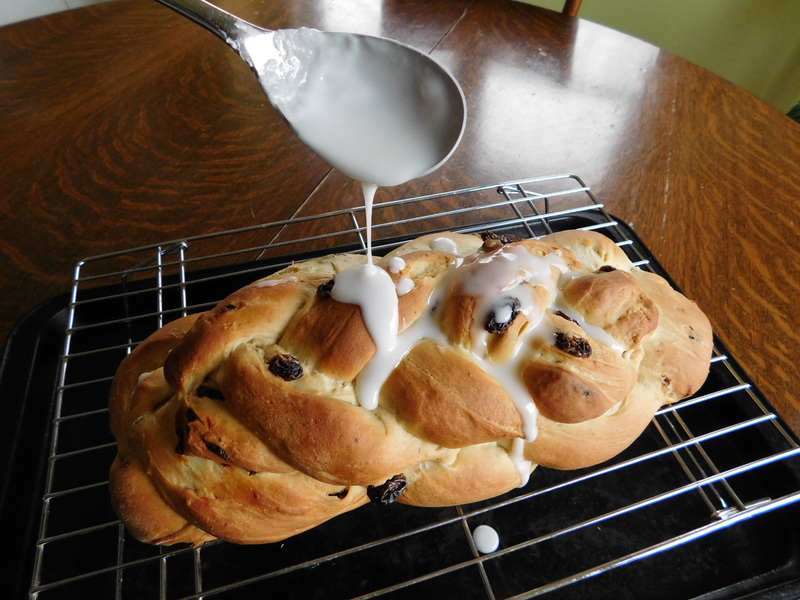 Drizzle over warm Easter Braid. 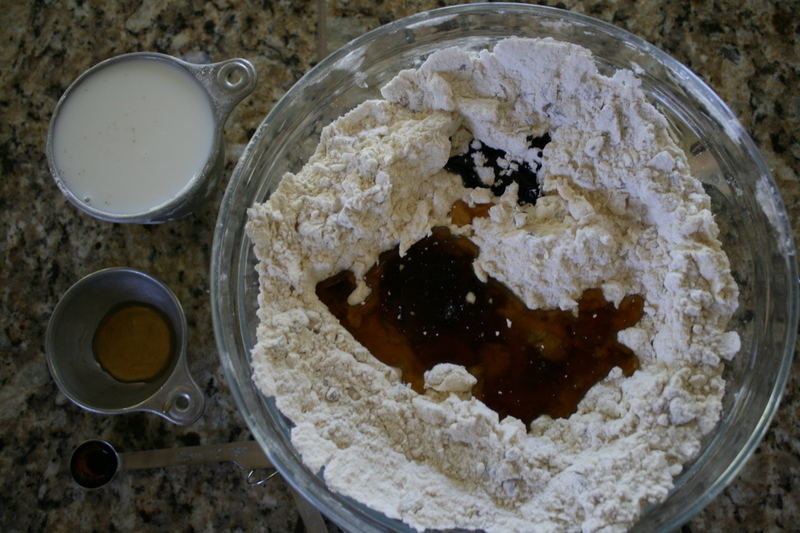 When the dough is mixed up, put it into the lightly greased bowl and flip it over. Cover the bowl with plastic wrap and let rise. 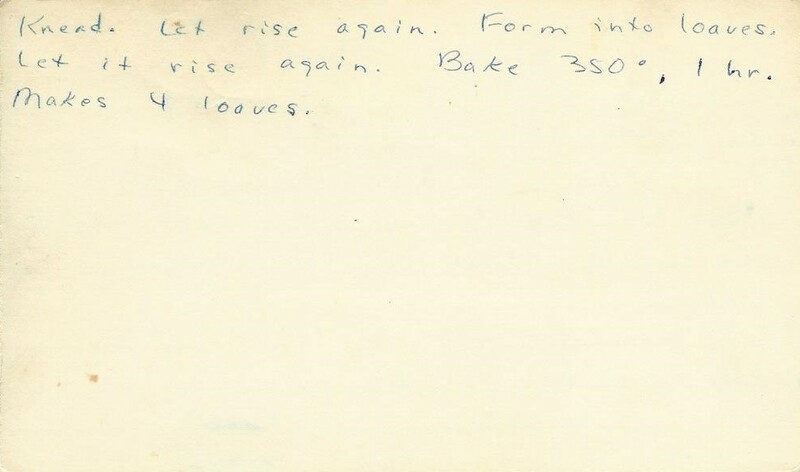 Let rise until double – about 1 1/2 hours. Punch down and let rise another 1 hour. 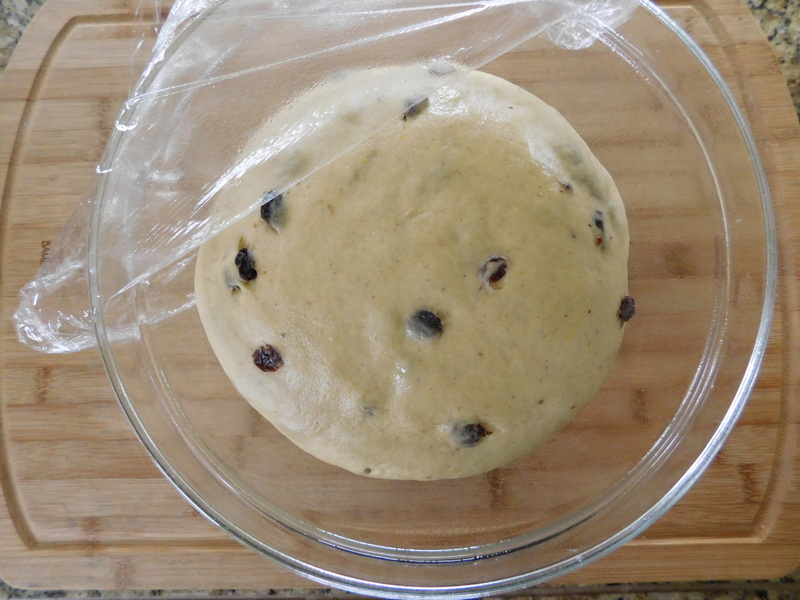 Divide the dough into two balls, cover, and let rest 10 minutes. Cut each ball into 4 even parts. Roll 3 of the parts into logs about 12 inches long and braid together loosely. tucking under the ends. Cut the remaining part into 3 parts, roll those 3 parts into logs about 9 inches long, braid those loosely, and put on top of the larger braid, tucking in the ends. Cover and let rise until double. After the loaves are baked, drizzle on the Sugar Glaze. What a perfect place for an action shot! I don’t know – is that enough glaze? What do you think? I think it’s a good thing this recipe makes 2 loaves. That’s what I think. I really don’t know why I’ve never tried this recipe before. It’s weird – for all the years I’ve had this cookbook. I’m just glad I decided to try this one now. I WILL be making this one again. It’s amazingly delicious and I can’t wait to try it as a sandwich with our Easter ham. This is the year – try this Easter Braid and “wow” your family and friends! 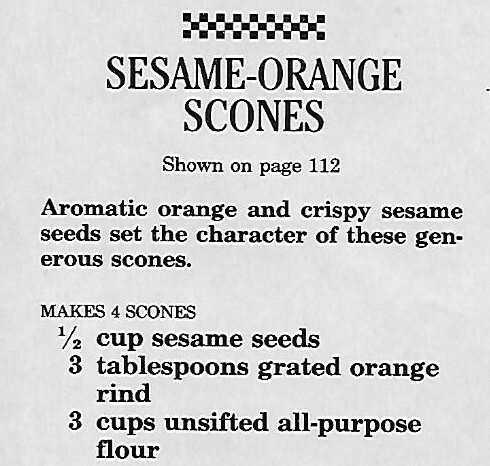 Today I’m sharing a recipe for Sesame-Orange Scones that comes from a magazine article that I ripped out of a magazine years ago. This magazine article had both the Chocolate Chip Scones and Maple Pecan Scones recipes in it, and as I’ve said before, I’m working my way through trying all of those scone recipes because they’ve all been so good. I can’t remember what magazine I ripped them out of (although I THINK it might have been Country Living Magazine) but this ripped out article (which is 9 pages long) has been around here for years. 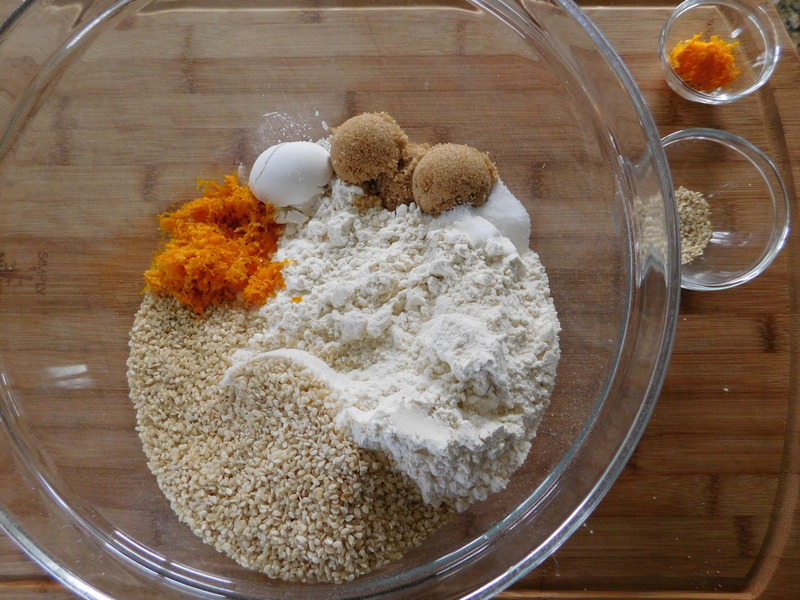 These Sesame-Orange Scones would be great for your Easter breakfast with that delicious sesame and orange flavor. 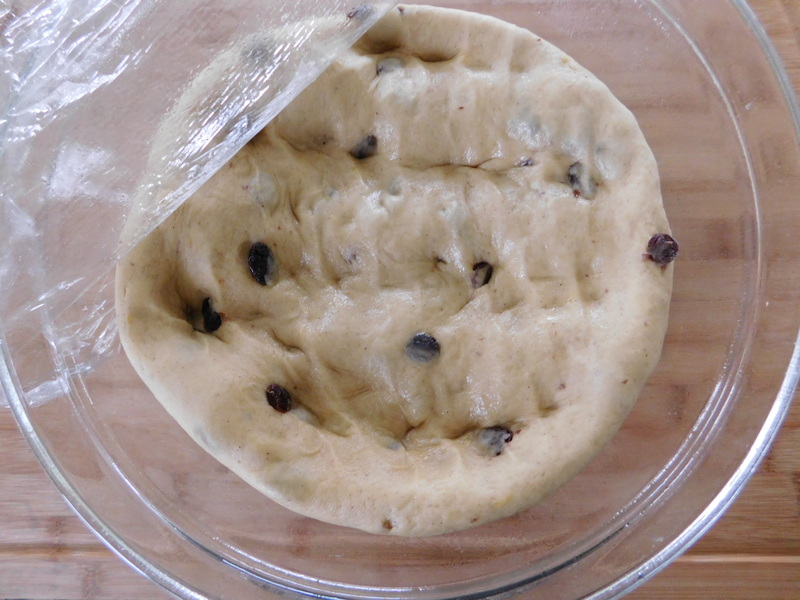 Mix lightly with a fork until mixture clings together and forms a soft dough. 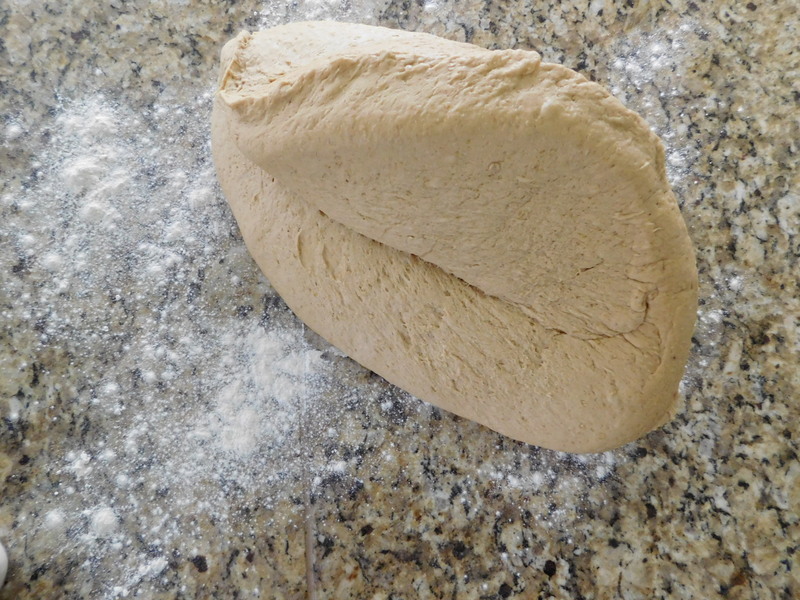 Turn dough out onto lightly floured surface and knead gently 5 or 6 times. 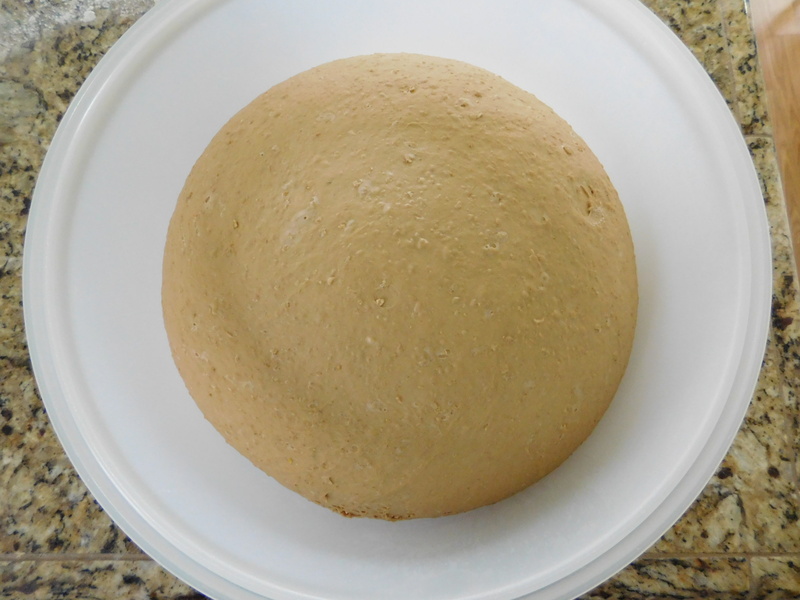 With a lightly floured rolling-pin, roll dough into a 7-inch round (I just used my hands to make the dough into a 7-inch round). 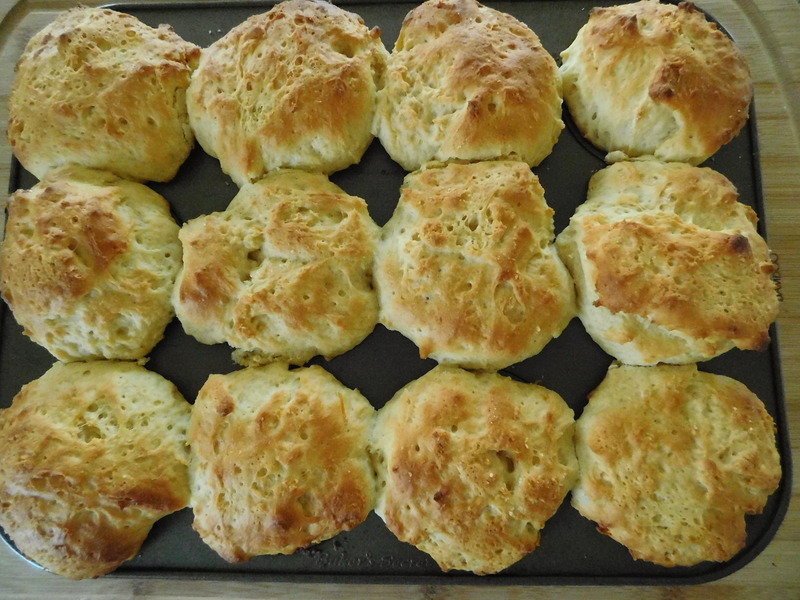 Place scones 1-inch apart on greased baking sheet. Pierce tops of scones with a fork. Brush over tops of scones. Bake at 425 degrees for 15-18 minutes or until golden brown. Brush again with orange glaze. 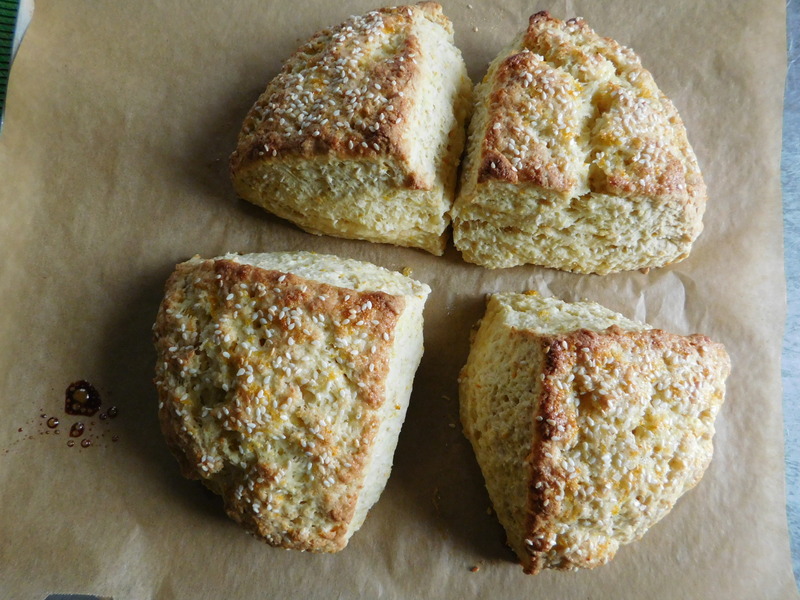 Sesame seeds seem to be an unusual ingredient for scones, but they do add a nice, crunch along with a nutty flavor. I used my pastry blender to mix in the butter. Ready for the orange juice. 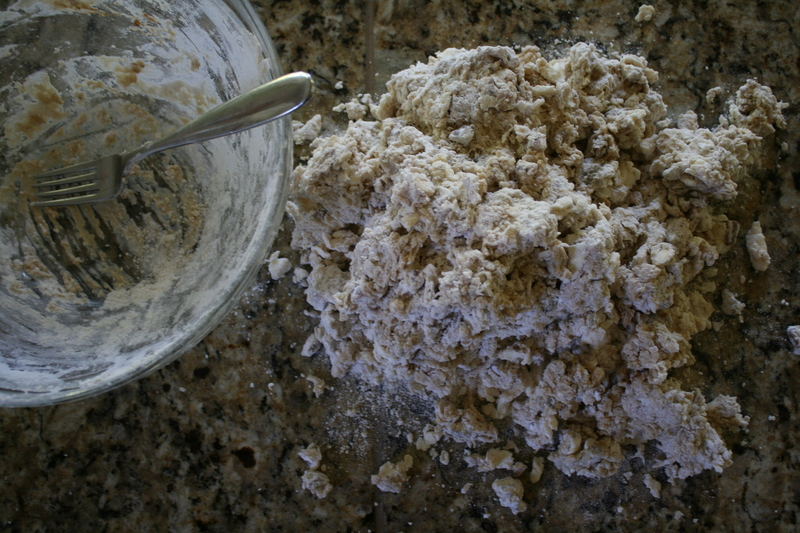 This was how much I mixed it with a fork before turning it out to knead. I wanted to make the recipe just as it was, but next time I would definitely cut the 7-inch round into more than 4 pieces. 6 or even 8 scones seems more logical. 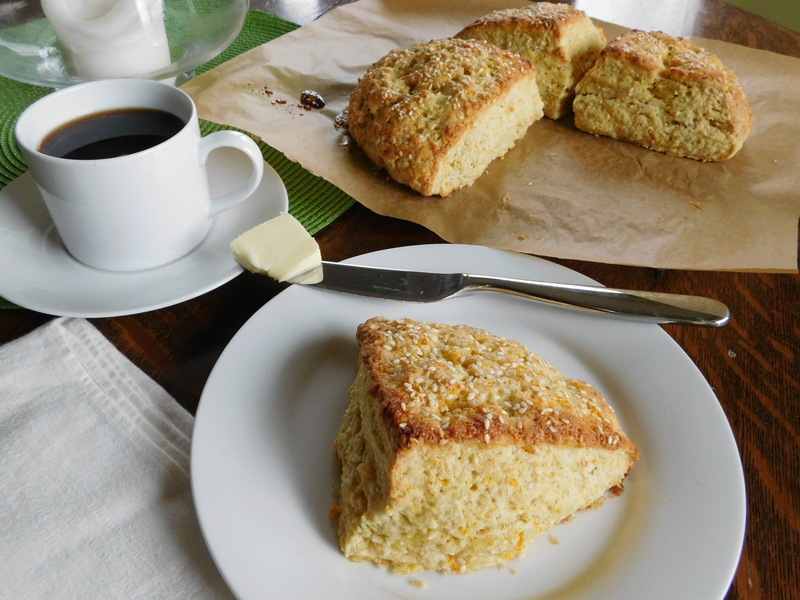 The scones were huge in the end, and a bit doughy inside – not quite baked through. Cutting them into smaller scones would help that not happen next time. 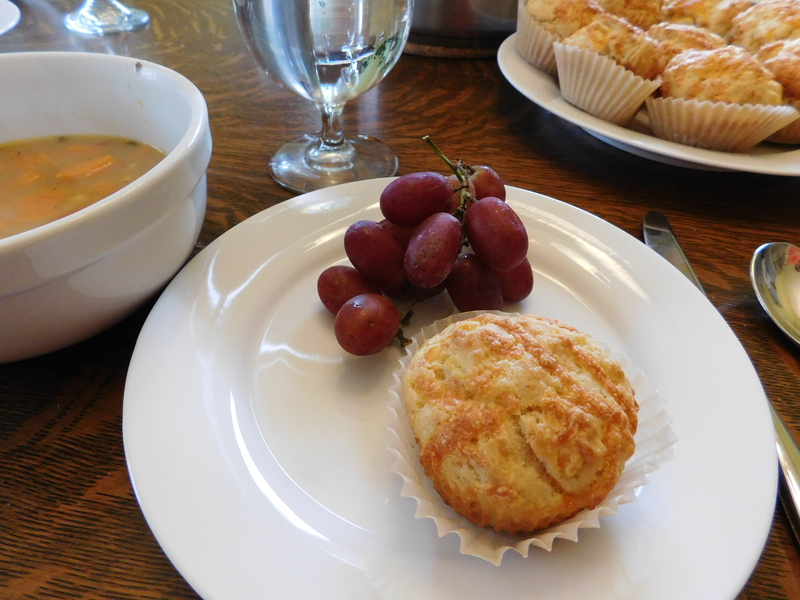 Even though they weren’t quite done in the middle, these scones were amazingly delicious. They’d be another great treat for Easter morning. That crunch of the sesame seeds and the delicious and somewhat sticky orange glaze make these melt-in-your-mouth delicious. 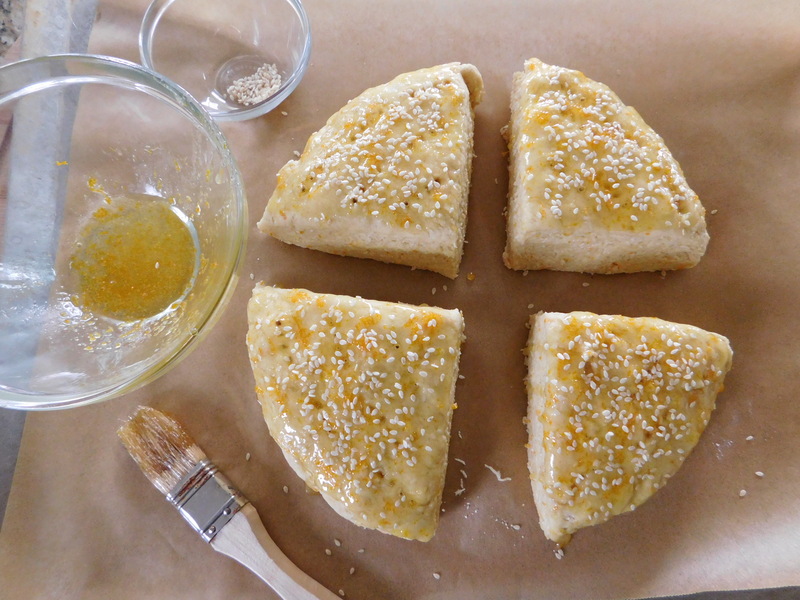 Your family would love it if you made these Sesame-Orange Scones for their Easter morning breakfast! 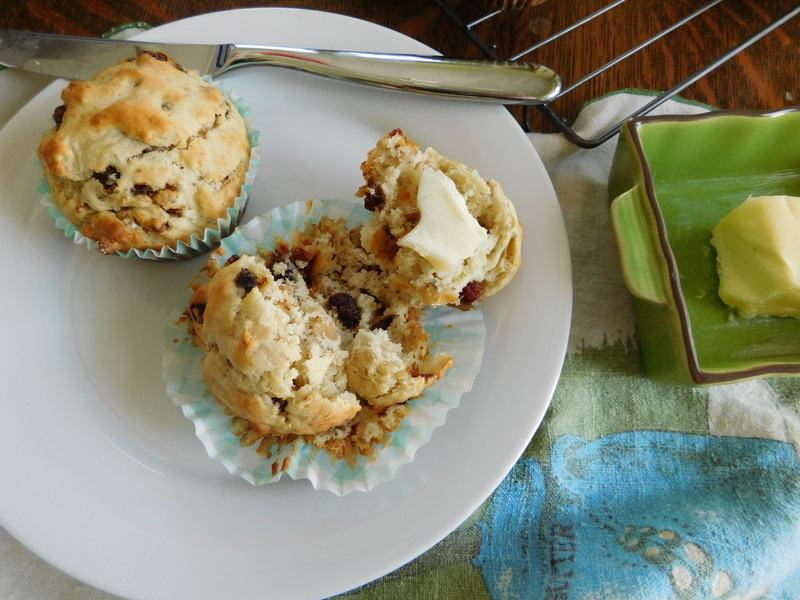 This recipe for Date-Nut Muffins is a variation of the all-purpose recipe for Muffins in Grandma’s old church cookbook. I have said before – and you all know how I feel about those old church cookbooks – those recipes are just the best. 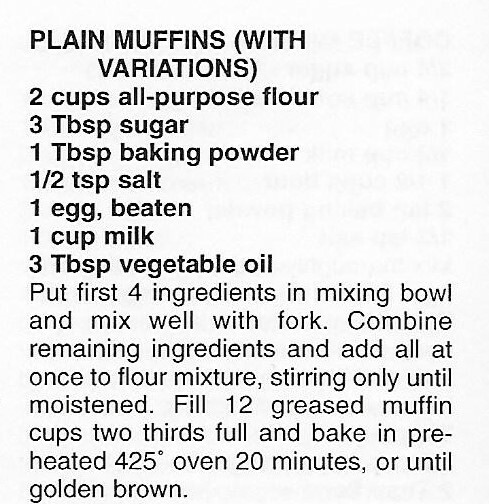 This all-purpose recipe for Muffins in Grandma’s old church cookbook has 13 different variations along with it! 13! It just shows you how recipes can be modified to suit YOUR favorite flavors and tastes. I just love that. I intend to try ALL the variations, because I’m sure they’re absolutely delicious, like these Date-Nut Muffins and the Cinnamon-Sugar Muffins I’ve already made. You really could and SHOULD play around with this recipe – add YOUR favorite flavors and let me know how it goes! So let’s get on with THIS variation. Here’s where the variation comes in: Add to the dry ingredients 1/2 cup chopped walnuts, 1/2 cup chopped dates, and 1 Tablespoon grated lemon rind. 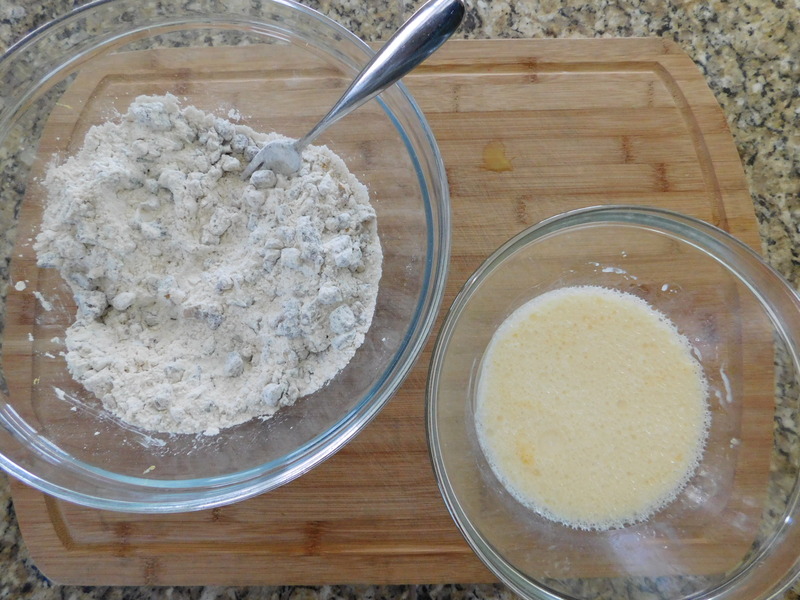 Add all at once to flour mixture, stirring only until moistened. Fill 12 greased muffin cups 2/3 full and bake at 425 degrees for 20 minutes or until golden brown. 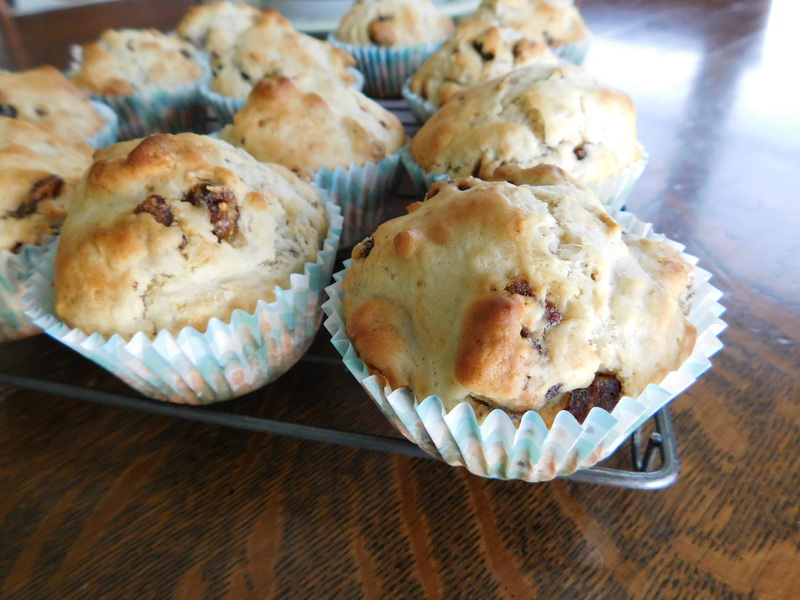 These muffins are made from very basic ingredients – it what you add to them that makes them special! 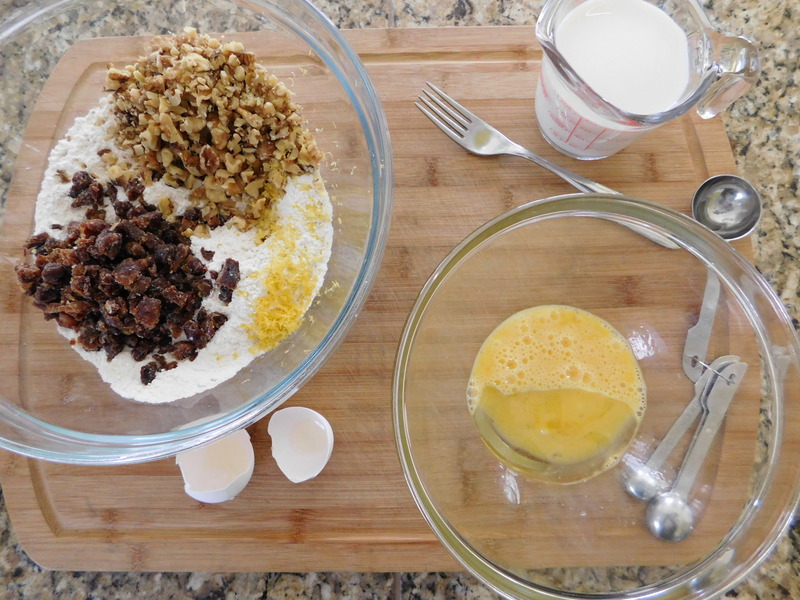 Get the dry and wet ingredients ready before mixing – only until moistened. 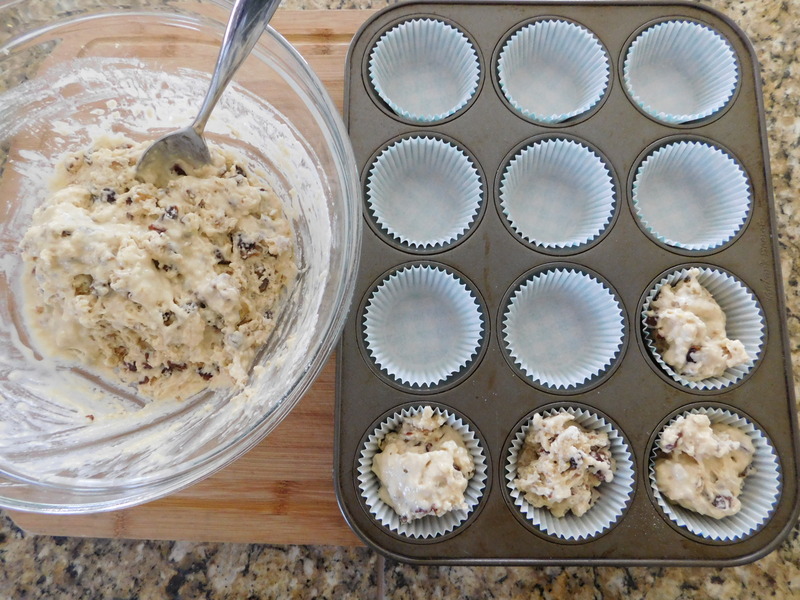 You can put the muffin batter into greased muffin tins, but I like to use papers. Baked to perfection. Too much browning and I think they get a bit dry. You just have to eat them warm – with lots of butter melting everywhere – and running down your arm. Just sayin’. This muffin recipe is one to keep in your arsenal, just because it can be modified so easily – for a specific flavor, for a specific holiday, for a specific taste. 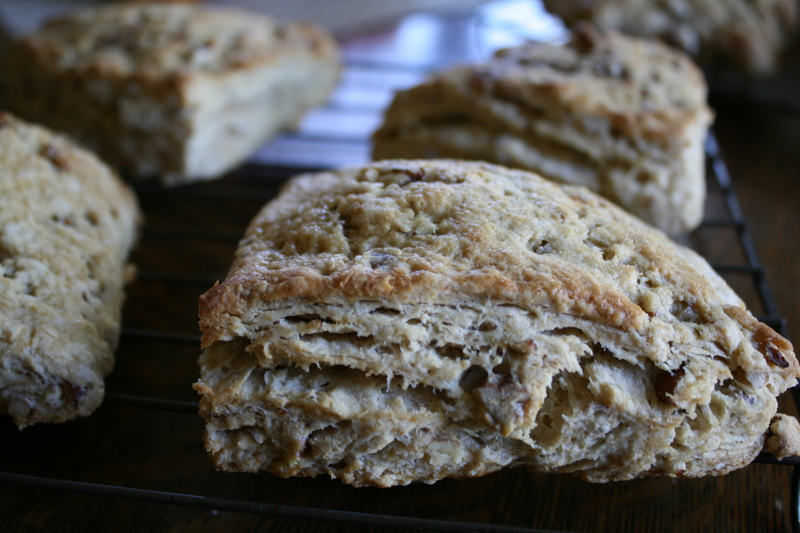 The flavor of date, walnuts, and that little bit of lemon rind in these – amazing. I love these muffins and so will you. Make up a batch of these Date-Nut Muffins – right now – and see how easy it is to make them just the way you like them! 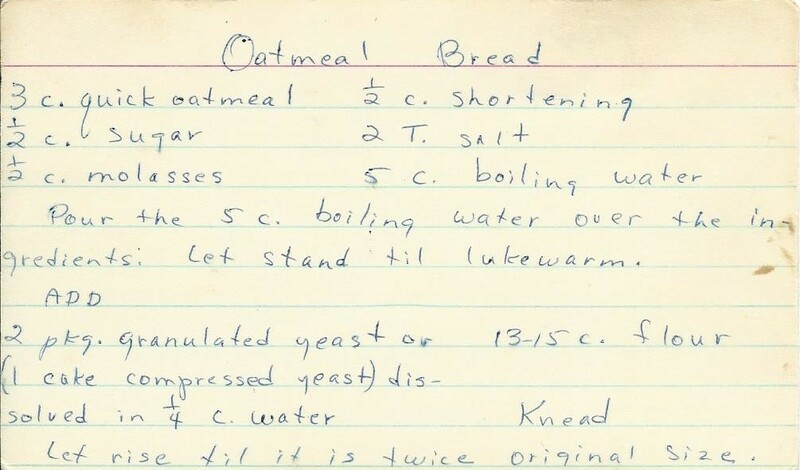 Today’s recipe comes from my mom, and it makes a large batch of Oatmeal Bread. This recipe says it makes 4 loaves, and since that seems to be basically double the usual batch of homemade bread, I knew it was gonna be big. I didn’t think I could use my big mixer since this was a huge batch. I decided to do the whole thing by hand. Enter the hubs. I’m not quite up to speed yet since my bout of pancreatitis last year (I’m getting there – slow, but sure!) and I knew I’d probably “knead” some help. (Ha! See what I did there?) Well, he used to work in a bakery back in the day, so I enlisted his help with the kneading. I got it all mixed up and then he washed up and started kneading while I was taking the beauty shots. Pretty soon he looks up and takes a deep breath, “gotta take a break”. Ha! Rust never sleeps! I asked if he’d like me to take a turn, and he gladly handed over the kneading duties. I finished it off from there, and he kneading the second go round. Just when you think you’re all in shape and stuff, you find out that there’s a reason why we’re so glad we have a big mixer now and don’t “knead” to do this by hand anymore. What a workout! But it was sooooo worth it! This bread is really tasty! Let rise until it’s twice original size. Form into loaves and let it rise again. I knew I’d need a big bowl for this, so I used the biggest container I have. It has a lid, too, so when it’s ready to rise, just snap on the lid and let it rise. 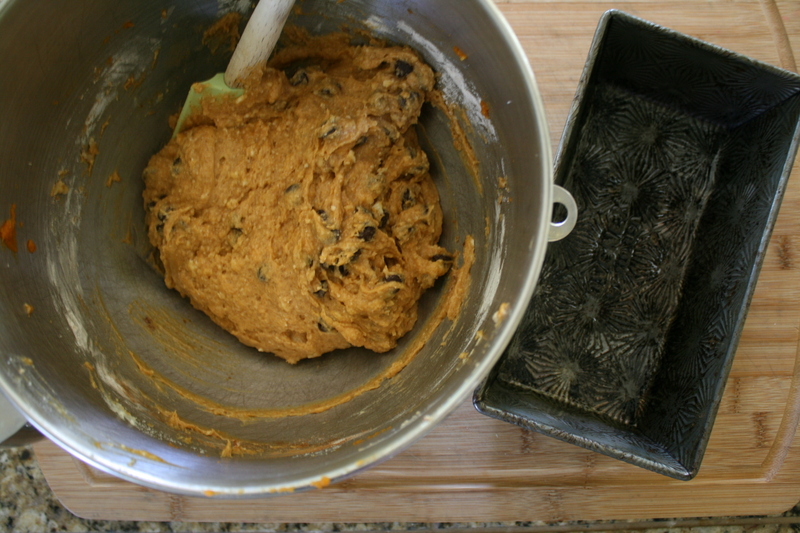 I just put all the ingredients into this big container and mixed the dough in there. 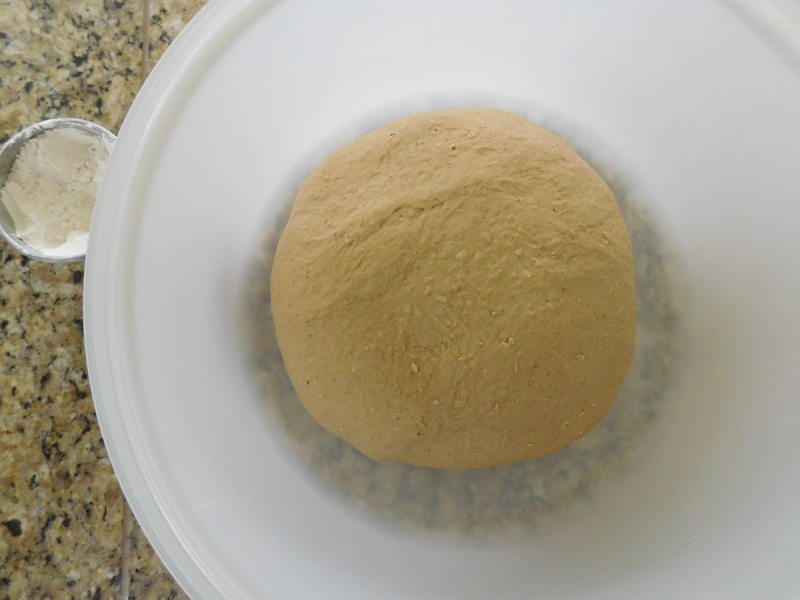 When we started kneading, I washed out the container and it was ready for rising. It worked ok to put the boiling water right in there with the ingredients. I mixed it up and the heat of the water melted the butter. 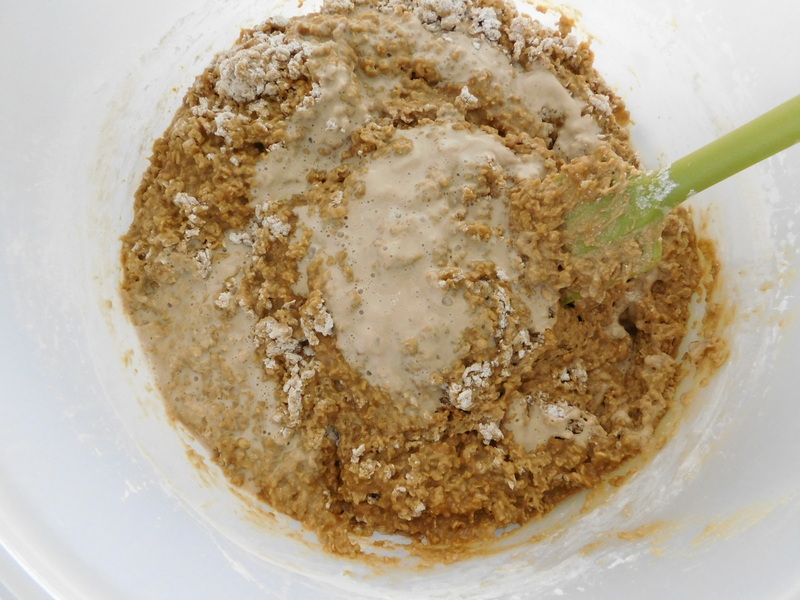 My husband suggested mixing in 2-3 cups of flour first and then adding the yeast dissolved in the water. Sounded good to me. The recipe calls for 13-15 cups of flour, but we thought it was good after 11 cups. 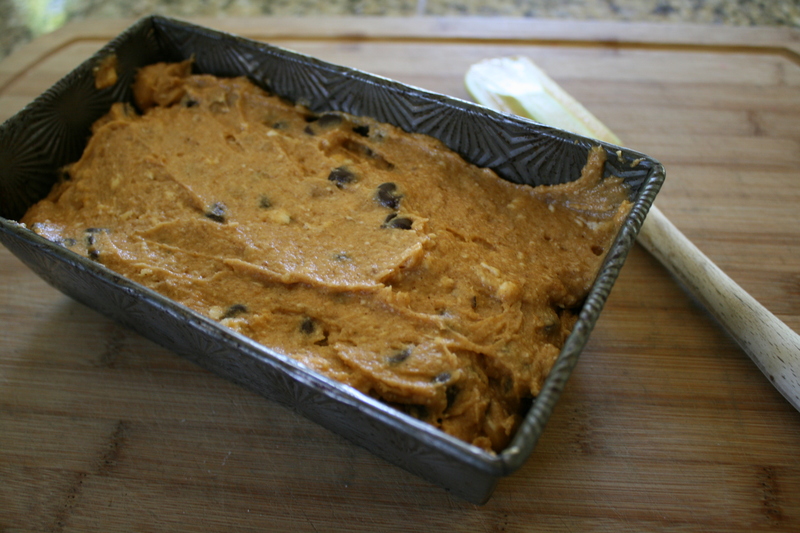 The dough wasn’t sticky anymore and if you add too much flour, the dough won’t be as tender. 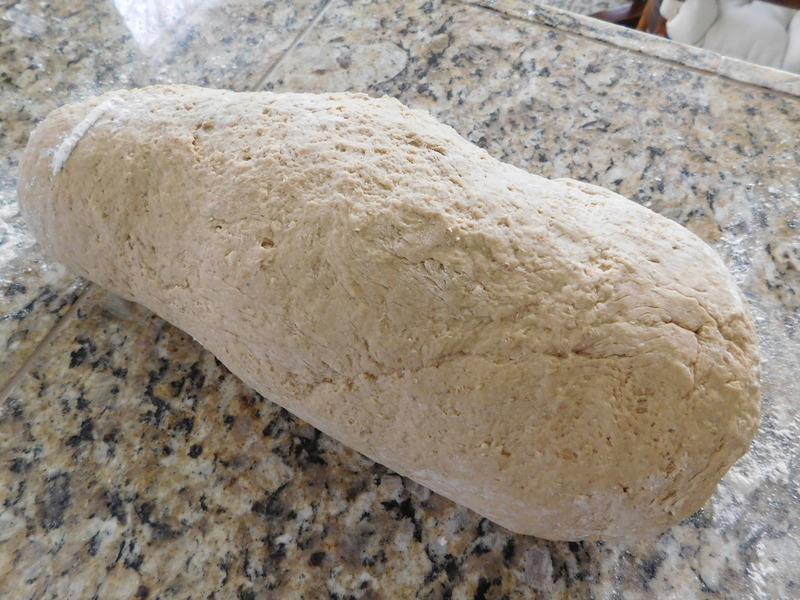 Here is the huge ball of dough after adding the flour. Ready to knead. Knead it until it’s smooth and the dough bounces back when you poke your finger in. 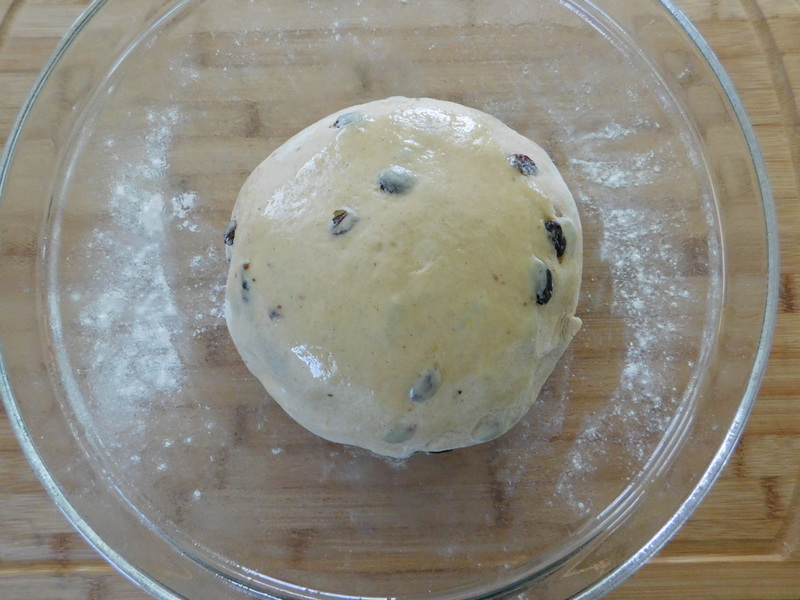 I just put the dough back into the container – now to rise until double in size – about an hour. Dump it back out and you’re ready to knead again. Not as long this time. Back into the container to rise again. This is how it looks after the first rising and it’s doubled in size. 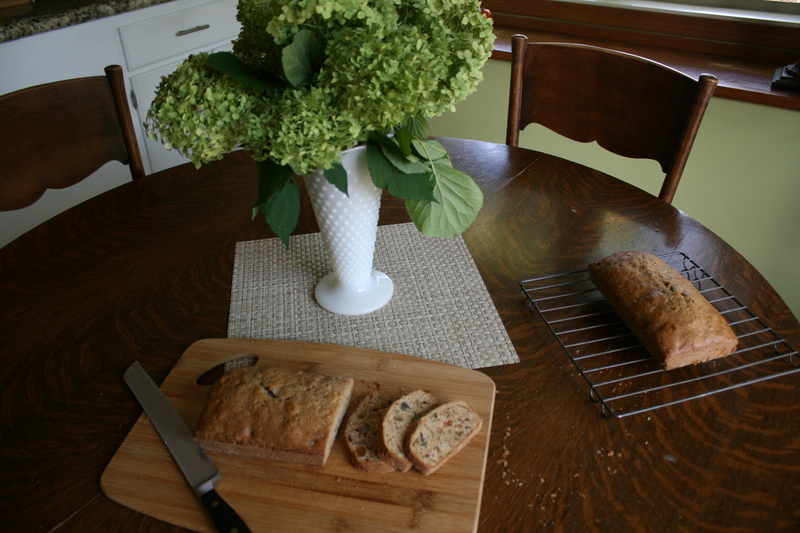 Then my ex-bakery worker husband made the loaves bakery style. 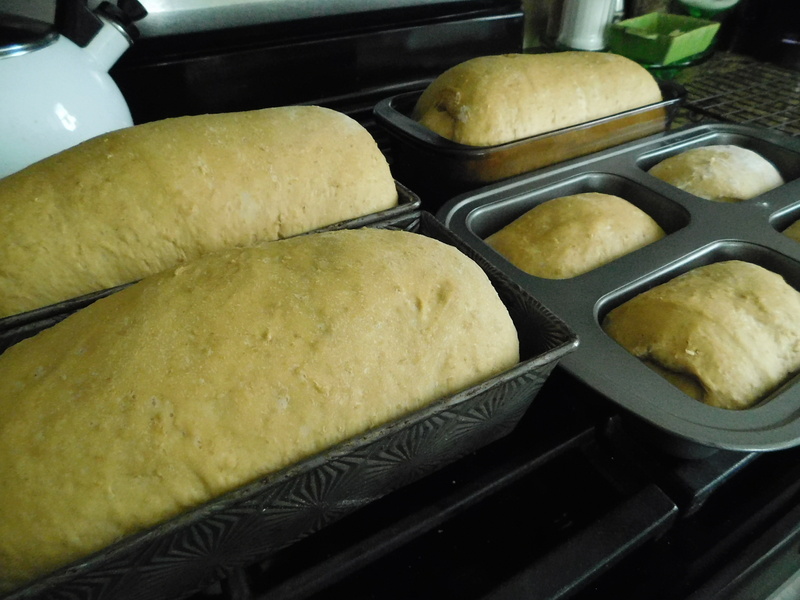 Instead of making 4 loaves, we made three big loaves and four small ones for giving to mothers and adult kids living on their own. Let them rise in the pans and then they go into the oven. While this does make a big batch of bread, it’s so totally worth the work. The bread is delicious and slices beautifully. We were even able to make toast with it! 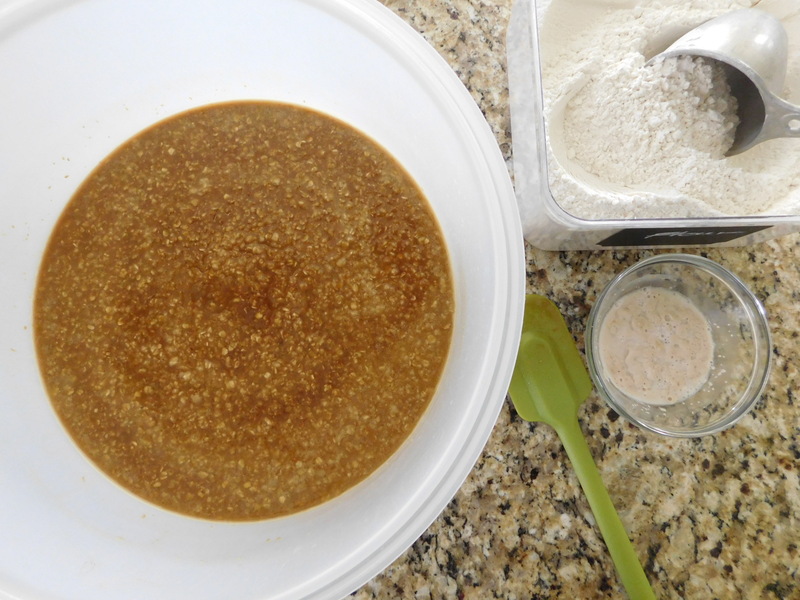 Roll up your sleeves, get ready for a workout, make a batch of this delicious Oatmeal Bread and see how easy and satisfying it is to make your own bread! 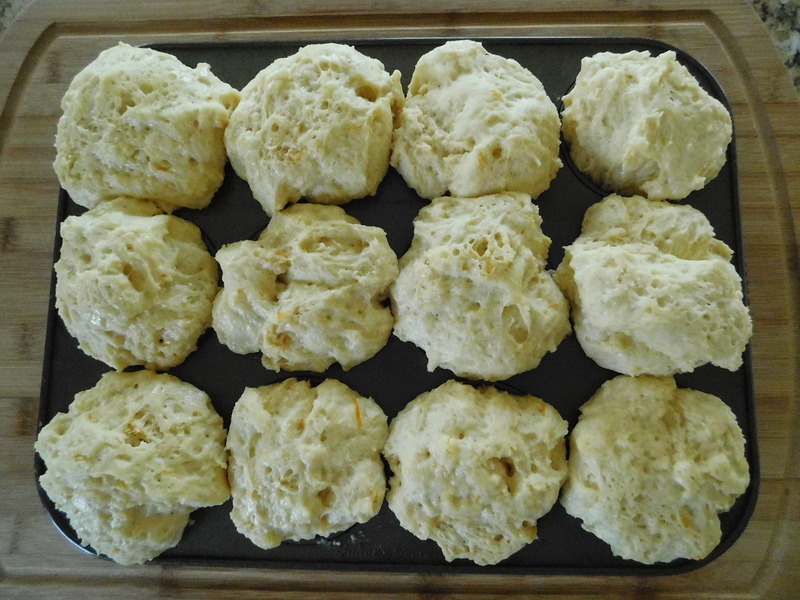 The recipe for today is for Orange Rolls (No Knead), and it comes from one of Grandma’s old church cookbooks. They sounded pretty easy to do, so why not? It is citrus season, after all – the perfect time of year for anything made with oranges. Who knew back then that someday “no knead” bread and rolls would be such a big “thing”?! 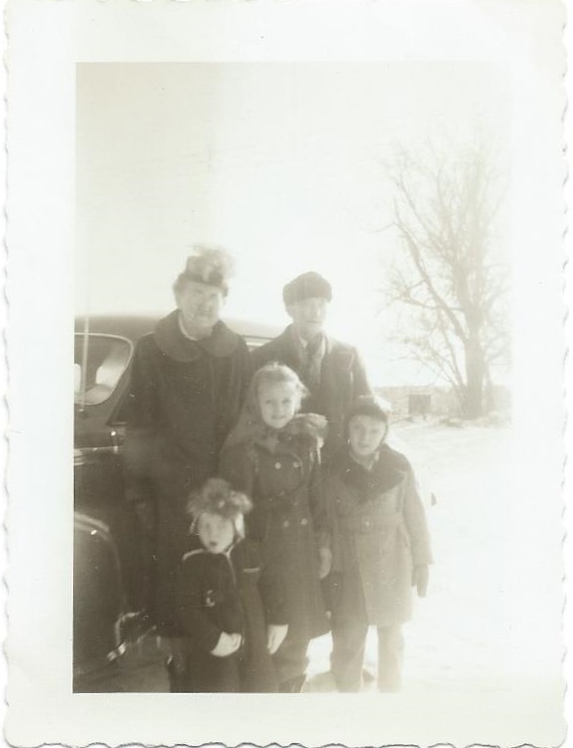 Because it’s winter time, I had to share this photo of my mom and her brother with their grandparents (Grandma’s parents), and it looks like they might have a cousin (the little guy) with them. We don’t have a lot of casual photos like this, especially in the winter and OUTSIDE! I wonder if this was a special occasion, or maybe it was a photo of a new car or something. Maybe it was just a shot of them before church, who knows. I love it, though – they all have interesting headgear on their heads! It must have been a cold day. So cute! Ok – back to the rolls. I used the grated rind from the whole orange (as long as I was grating it – you shouldn’t waste it, right?) and also the juice from the orange (added to the warm water to make 1 cup). 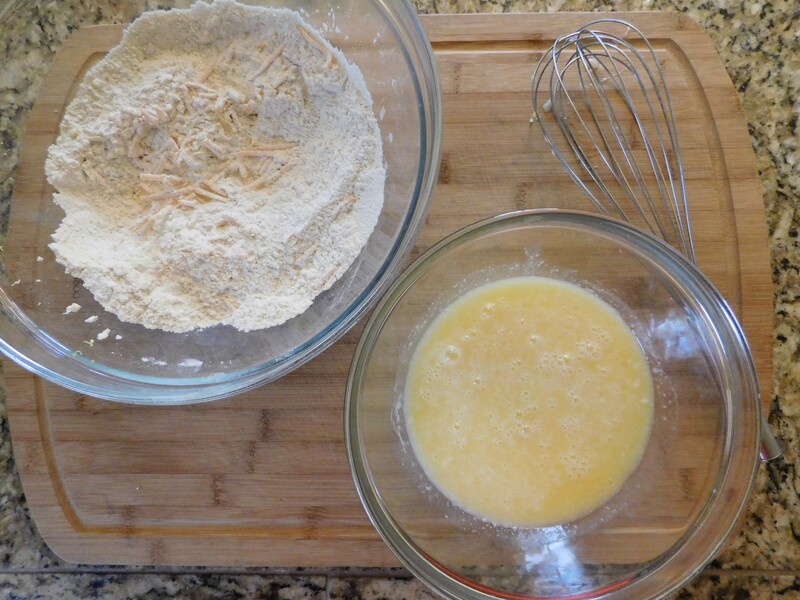 Pay attention to some changes as we go along – this recipe was a bit weird once I got into it. Add to the water mixture. 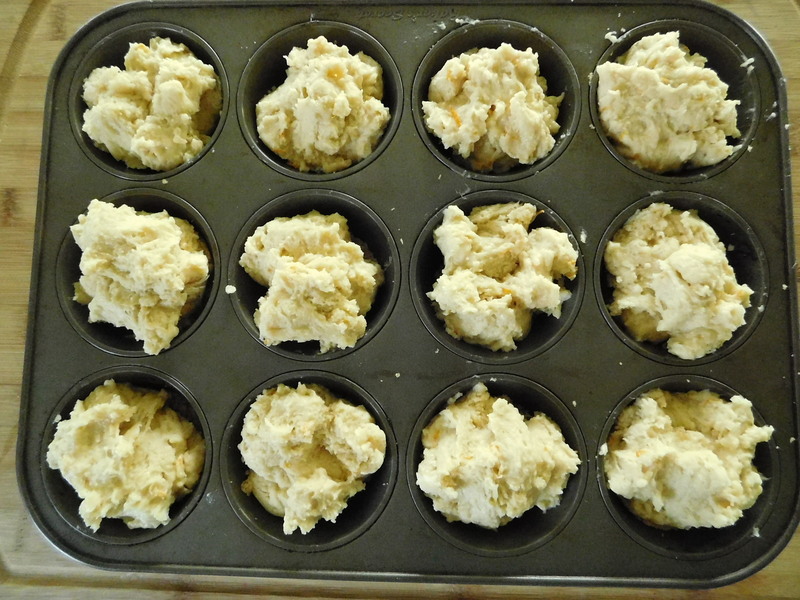 Spray muffin tins with non-stick spray or grease with butter (I forgot to do this – yikes!). 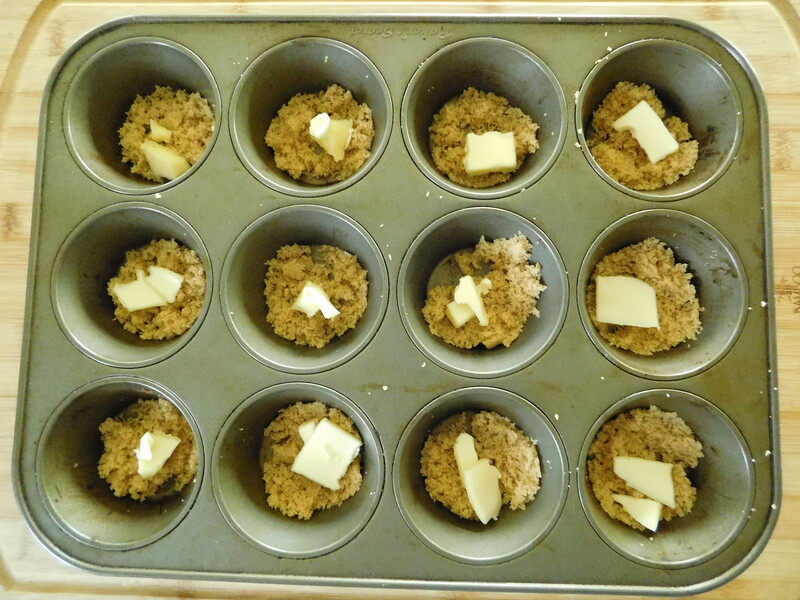 Put 1/2 teaspoon butter and 1 cup brown sugar in muffin tins (this sounded weird to me, and I wonder if it’s a typo – I put 1/2 teaspoon butter in each of 12 muffin tins and then added 1 Tablespoon brown sugar in each muffin tin). 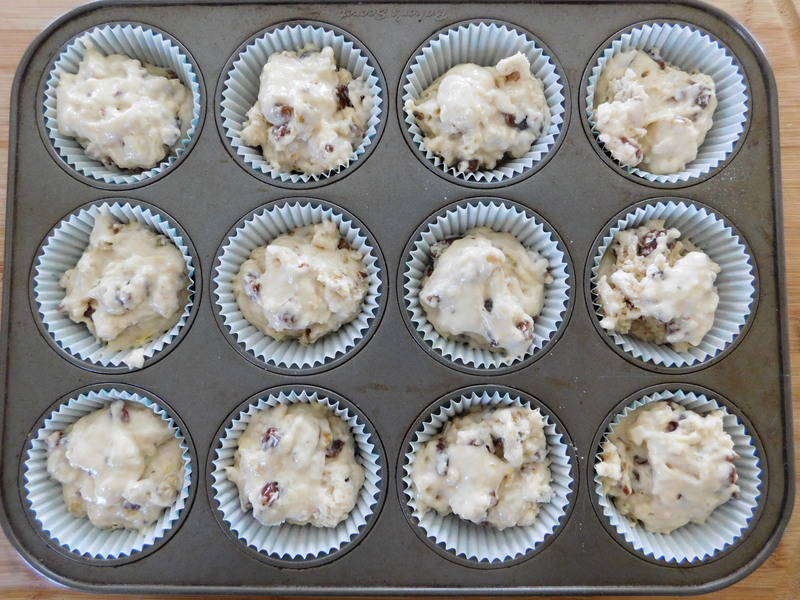 Drop by Tablespoon (this also sounded weird to me, so I just made the 12 rolls – 18 rolls would have been a better size, or maybe they would have been ok in a mini muffin tin). 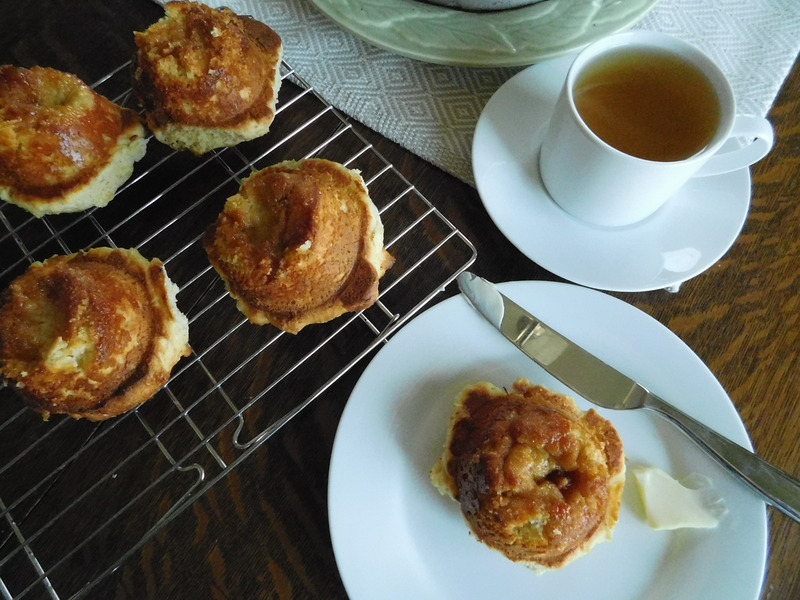 I didn’t think 1 cup of brown sugar for all the rolls sounded like enough, so I used 1 Tablespoon per muffin cup and 1/2 teaspoon of butter per cup. Oh yeah – and don’t forget to spray the tins – I did!!! 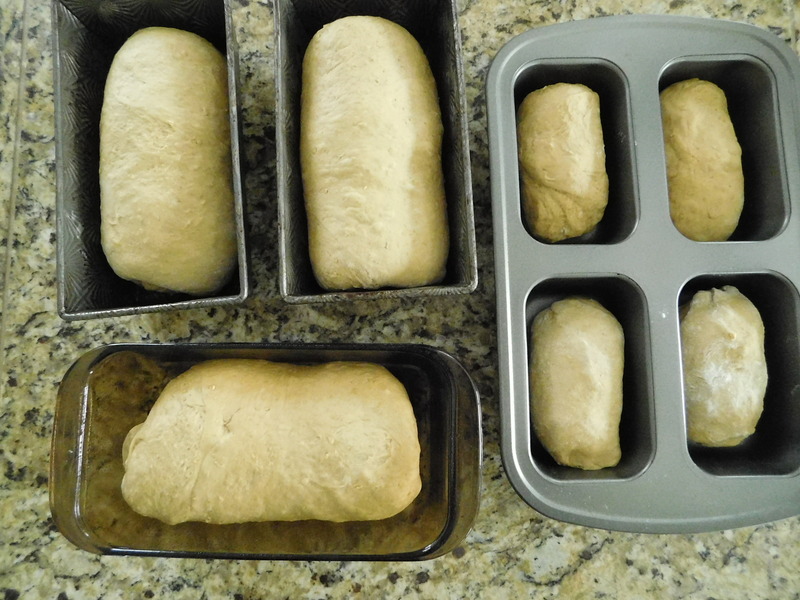 1 Tablespoon of dough didn’t seem like it would make a very big roll, either, so I made them bigger. Big mistake. You can see that the muffin cups were way too full. They almost overflowed. A smaller amount of dough would make a nice, small roll. Oops. I struggled a bit with this recipe. The caramel in the bottom of the muffin cup wasn’t sticky like I thought it would be. It was more of a chewy caramel. Even though I forgot to spray the muffin tins, they came out of the pan pretty easily when I used a large serving spoon to scoop them out. These rolls turned out to be kind of a cross between muffins and Buns, with the flavor of my famous Hopping Bunny Rolls. 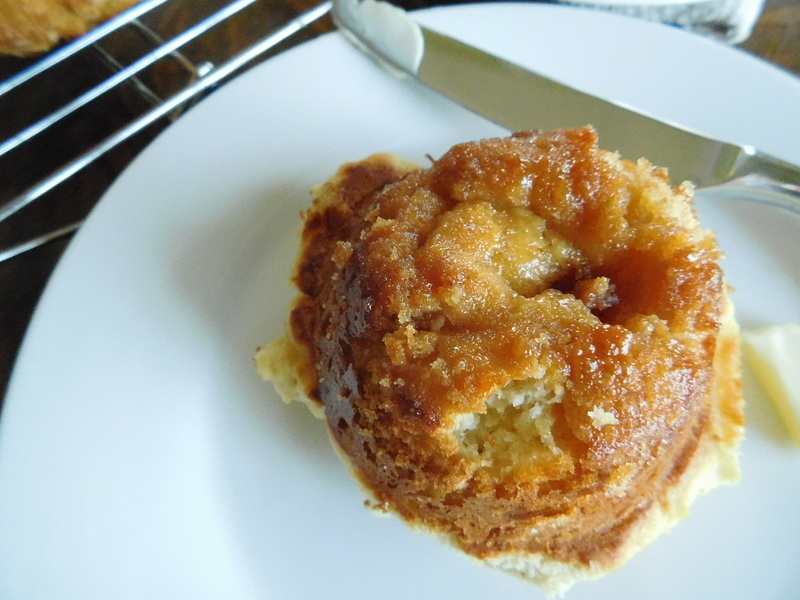 They are delicious, and are perfect with a morning (or afternoon) cup of coffee. Go ahead and give these a try. Just follow the recipe and don’t try to “fix” it like I tried to do. I should know better by now – just do what the recipe says. The farm wives who made these recipes and put them into the old church cookbooks knew what they were doing (as long as it’s not a typo). These Orange Rolls (No Knead) are delicious – you and your family will love them! 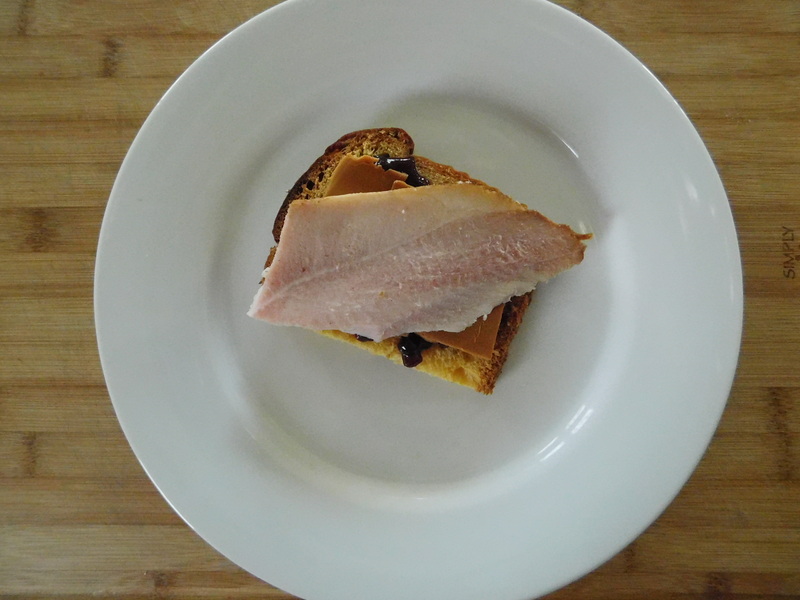 Ok guys – we’re making a Scandinavian Egg Sandwich today! Yes – you heard me! This sandwich can be made almost entirely from leftovers (for our family, anyway). It’s the perfect holiday breakfast, lunch, or snack, and it’s amazingly delicious! Our family made up this sandwich over the years, but it really came to be finalized in 2016 when my sister, her family, and my mom came to be with us for the whole Christmas holiday. Everybody loved it because it uses a lot of our favorite holiday foods. We usually have the ingredients (that are leftovers) at some point during the holiday season, so it really was a no-brainer. My family loves egg sandwiches. In fact, all of our kids HAVE to have their dad’s egg sandwiches at some point almost every time they come to stay with us for any length of time. They grew up on them with his making them before and/or after every sports event, drama event, or music event – and there were A LOT of those. There isn’t really a recipe, just a tutorial, and we’ll explore that for dad’s egg sandwiches at some point later. For now, I’ll just tell you how we made these particular egg sandwiches. I’m showing how to make this sandwich Scandinavian here, but it’s very easy to change this and make it just how YOU like it! Slice and/or toast 2 slices from a Julekaga, loaf of bread (or panettone or regular sliced bread), and put one slice on a plate. This is your platform for the rest of the sandwich. I don’t like mine toasted and that’s why I didn’t toast the bread here. My daughter was in Chicago this fall and brought home a panettone from her visit to Eatily, so I didn’t make Julekaga this year. 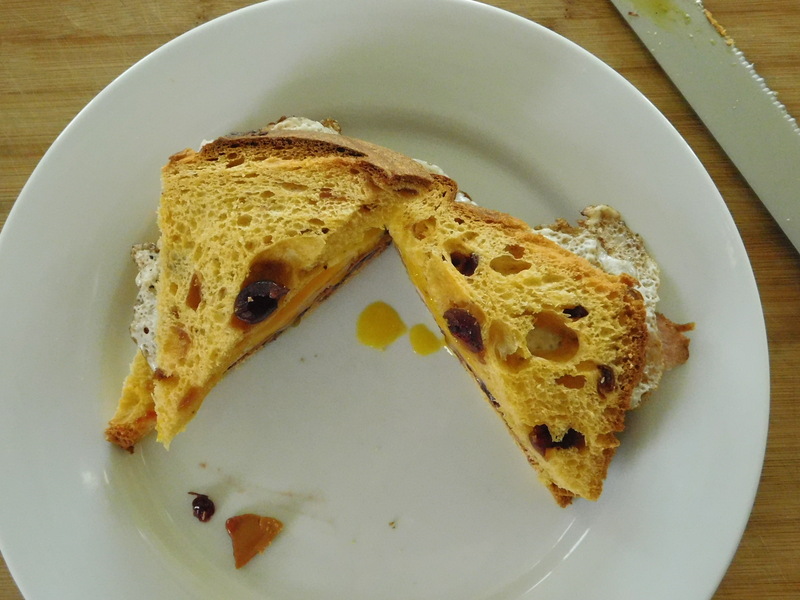 Normally I would use Julekaga, but this year I used the panettone for the sandwiches instead. 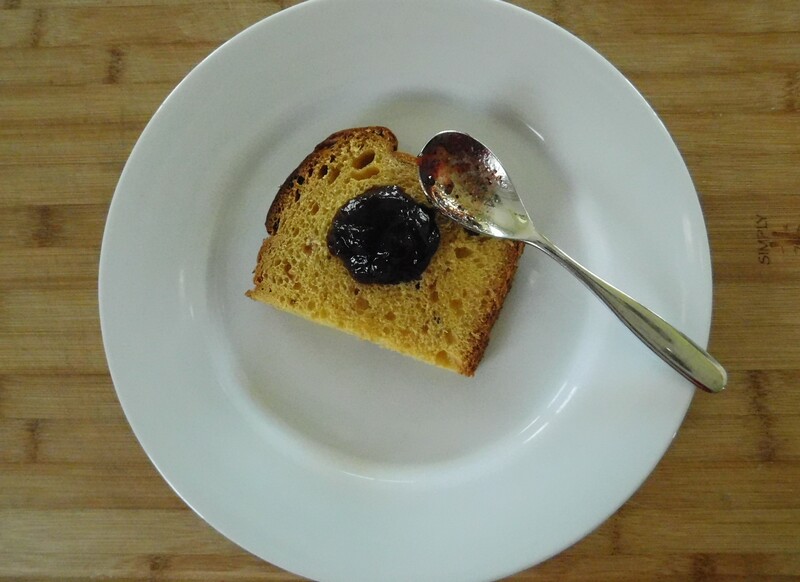 Dollop on a spoonful of your favorite jam. We used lingonberry jam to fulfill our Scandinavian theme, but any jam like strawberry or raspberry would also be delicious. 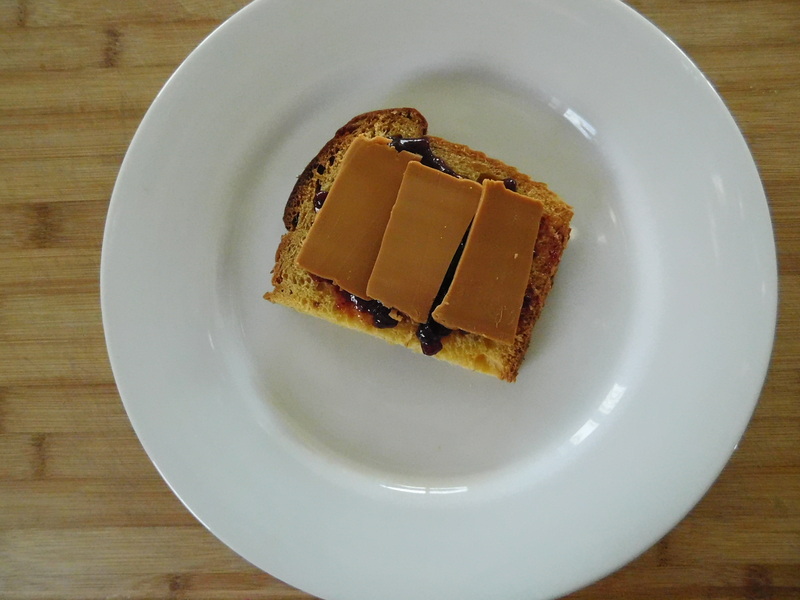 Layer on slices of brown fudge cheese (Gjetost) or your favorite cheese. We always have brown cheese for the holidays. If you haven’t tried it – I HIGHLY recommend it (it seriously does taste like fudge)! If you don’t want to try the most delicious cheese in the world, then use whatever cheese you like. Next comes a slice of Christmas ham. We have fried the ham at times in the past, but this ham was very flavorful and I didn’t feel like it needed to be fried. If you like it hot, go ahead and fry it first. You could also use turkey, so this would be good for a thanksgiving treat, too. Just use cranberry sauce and turkey instead of jam and ham. Last, but not least, a fried egg goes on top. I like a fried egg on mine, and I like it a bit drippy, but you can put on whatever kind of egg you like. My husband likes to break the yolks of his eggs when making an egg sandwich, because he likes to “mess” with stuff while he’s “cooking”. He just folds it up into a square of cooked eggs and puts that on top. Top it with the second slice of bread and cut it in half. Eat it like a sandwich, or use a knife and fork – whatever works. It’s so delicious – you’re just not going to believe it! You can tell it’s good by the way the egg yolk and jam somehow drip their way down your fingers and hands. Go ahead and lick your fingers – you won’t want to waste a bit of it! 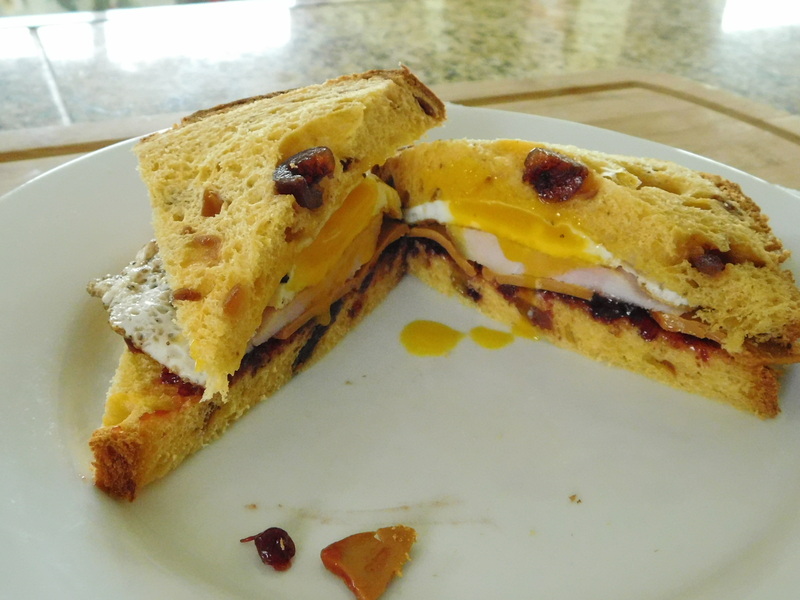 This sandwich has everything you’d want in an egg sandwich: tender, fruity bread, sweet jam, salty ham, the delicious, drippy egg. What more could you want?!! It’s the perfect after holiday breakfast or snack, as far as I’m concerned. You’re using up some leftovers and it’s ridiculously delicious to boot! I know you’re going to love it. 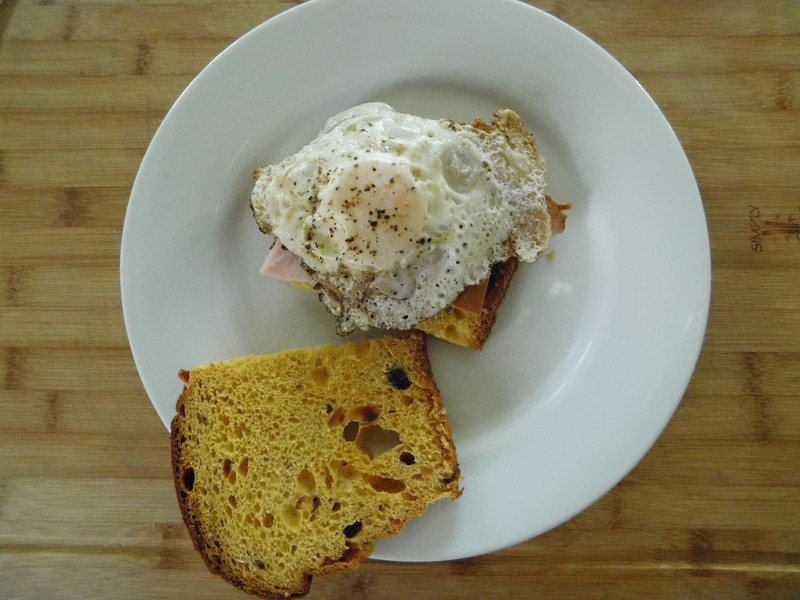 Bring out your inner Viking and try this Scandinavian Egg Sandwich! 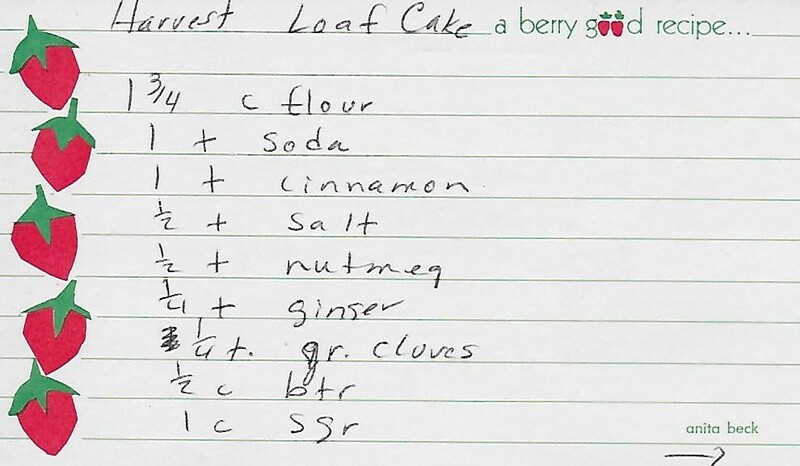 Today’s recipe for Harvest Loaf Cake comes from my mom. I have no idea where she got it from, but I’m glad she got it! I’m putting it under the heading of both bread AND cake. It’s a bit of a show-stopper, and perfect for your thanksgiving dessert table. Because we’re so close to thanksgiving, and thanksgiving is all about family, I had to share this photo of Grandma’s youngest brother from sometime around the late 1910’s or early 1920’s. 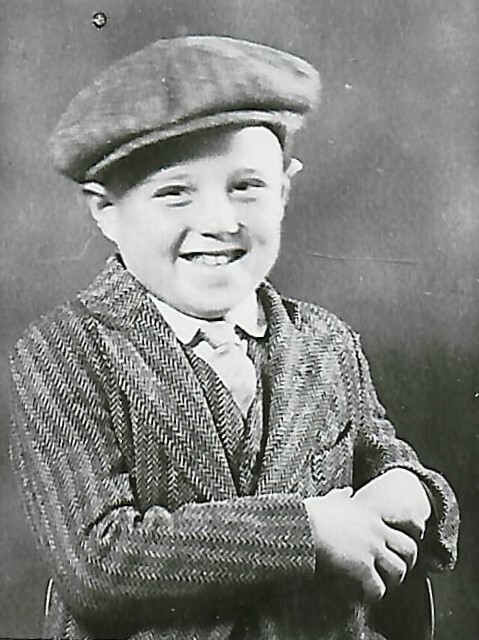 He was the youngest in the family, and always had that smile on his face. I love this photo so much! He looks like he’s straight out of the musical “Newsies”! Look at that hat, and that little coat! If you look close, you can even see the little vest he has on under the coat. Oh – and a tie! Love it! What a cutie! Grandma loved ALL of her family so much – it was one of my favorite things about her. Absolutely everyone (sisters, brothers, nieces, nephews, grandchildren, great-grandchildren) was special, and loved, and just as important as everyone else. Ok – now that I’m remembering her and how special she was to me, I’m tearing up. Good memories can do that to me. 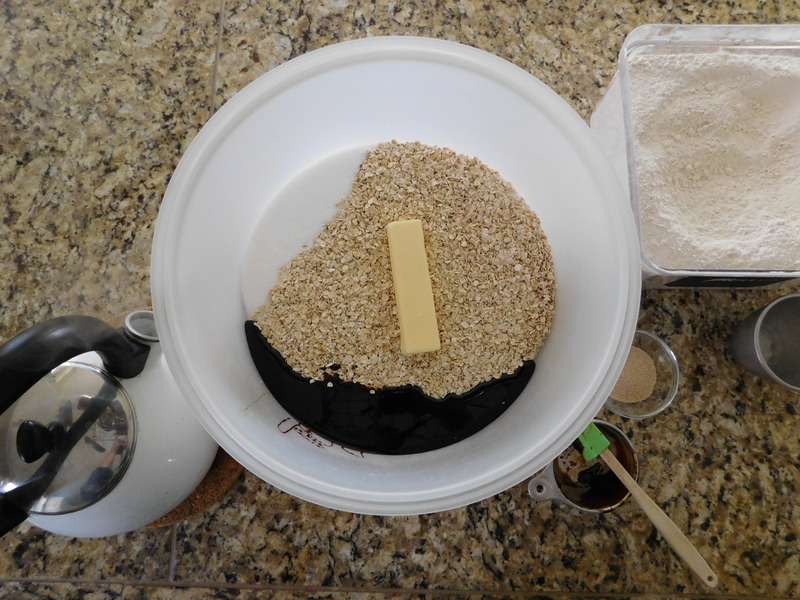 Ok, ok, on to the loaf/cake! There seems like a lot of steps, but most of it is all the spices in here. It’s a pretty easy recipe (Grandma would have loved it), so you can pull it together fairly quick. We like that, don’t we? Quick and easy recipes? You betcha!! I sprayed my loaf pan with a bit of non-stick spray before putting the batter in. Bake at 350 degrees for 65-75 minutes. Let stand 6 hours before slicing. 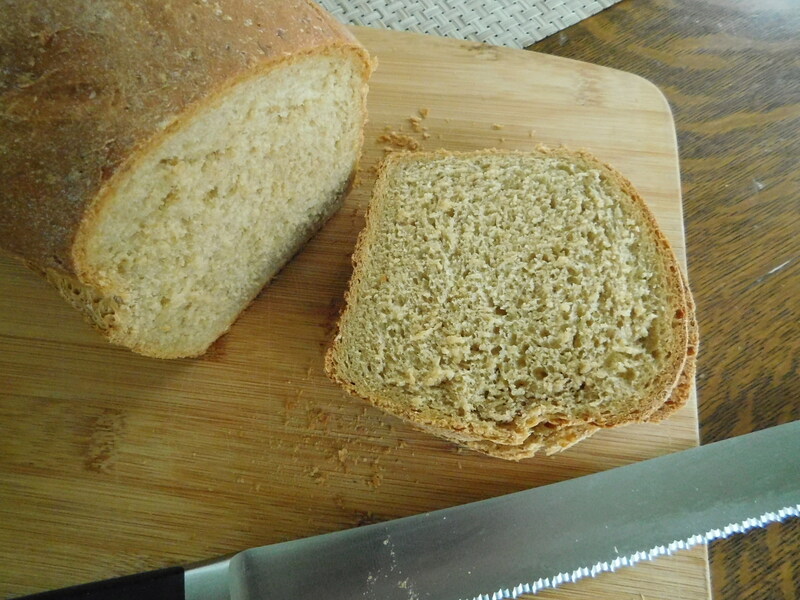 It’s a pretty thick batter, but the loaf/cake comes out tender and delicious! 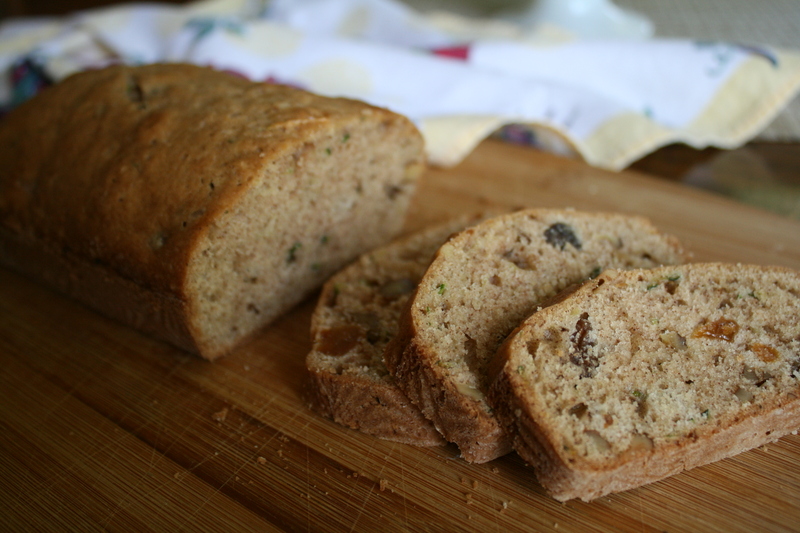 Oh how I love chocolate chips and walnuts in a quick bread! After baking it comes out of the pan beautifully. See how pretty it is after adding the glaze and walnuts?!! Since I’ve never made this before, I didn’t know how finely to chop the walnuts to sprinkle on top. While this looks pretty, I’d chop them a bit finer next time. I think this is a show-stopper. It’s easy to do, it’s delicious, and it looks fabulous! I mean, absolutely fabulous! 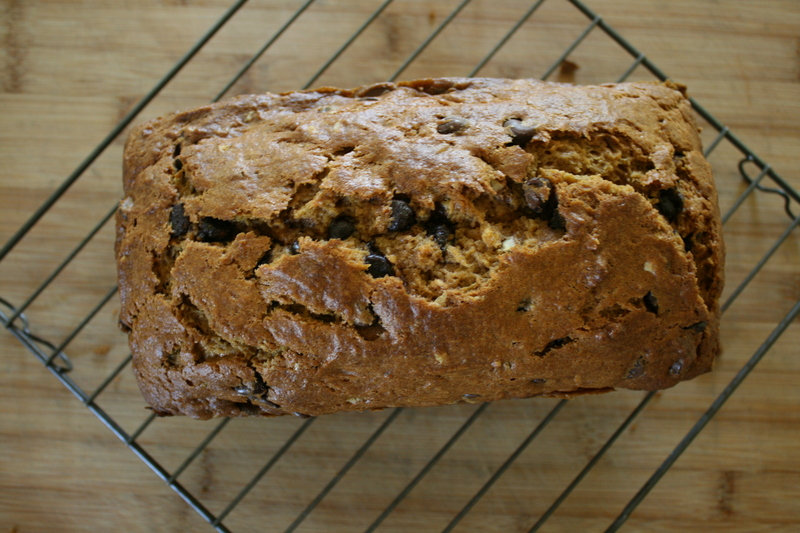 The recipe is similar to Moist Pumpkin Bread or Pumpkin Raisin Bread, only with chocolate chips. 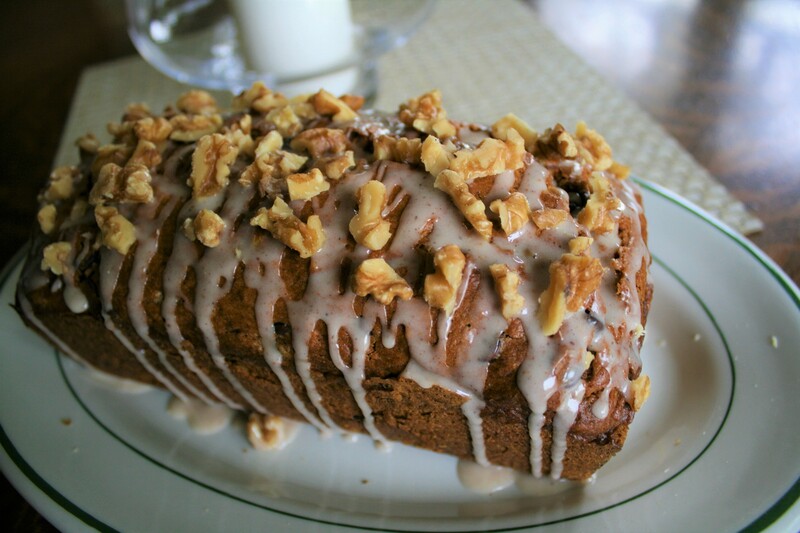 Then you add the tasty glaze and the chopped walnuts, and there you go – show-stopper! 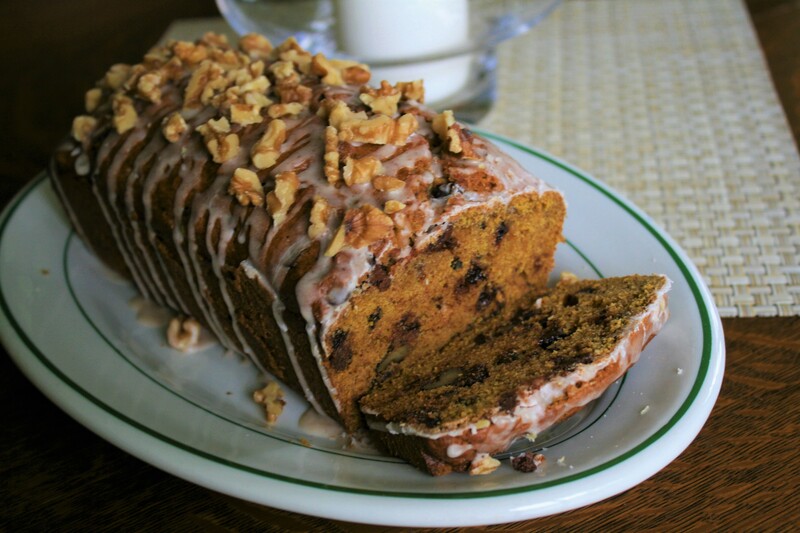 Try this Harvest Loaf Cake with your thanksgiving desserts. 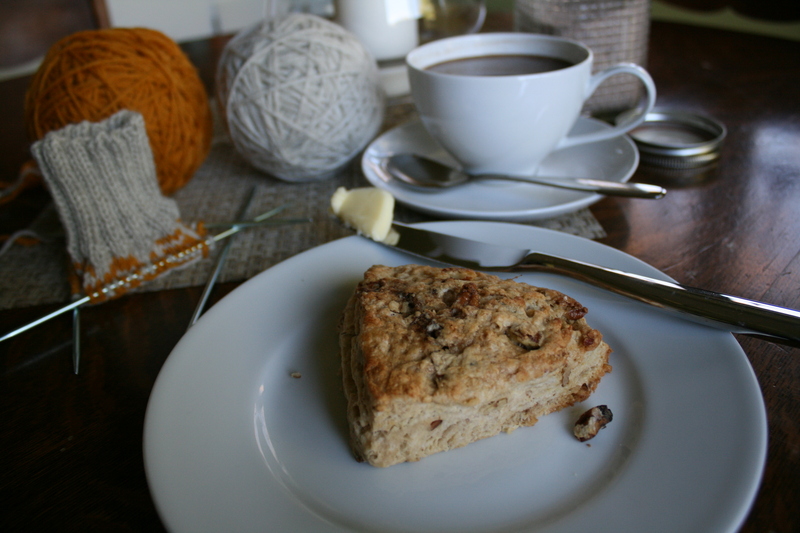 I’m sharing my recipe for Maple Pecan Scones today. It comes from the pages I ripped out of the magazine years ago. These magazine pages have several recipes on there, one being the ridiculously delicious Chocolate Chip Scones I made last summer. I hadn’t made this particular recipe before, but it sounded like a perfect recipe for fall. Well, this recipe didn’t disappoint. These scones are as ridiculously delicious as the Chocolate Chip Scones. Wow. Why haven’t I been making these all along? I’m glad I finally did. 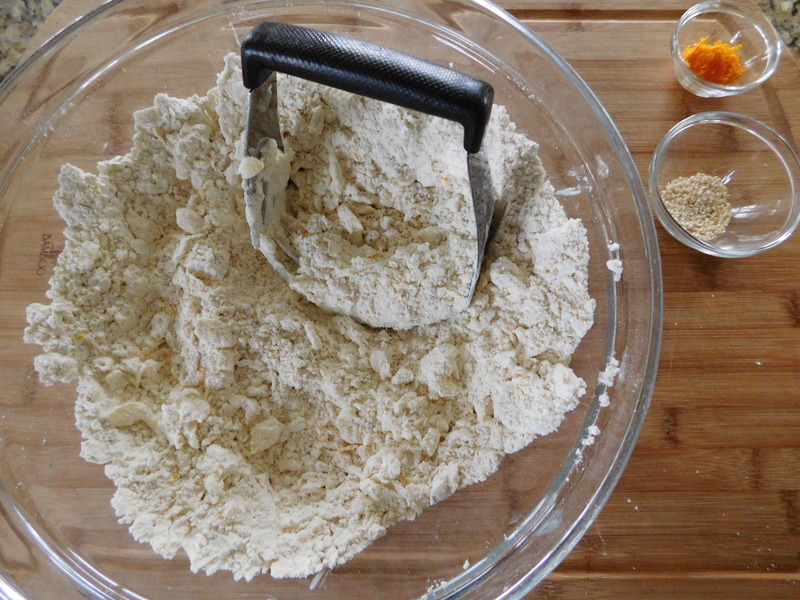 Turn dough out onto lightly floured surface and knead gently 5-6 times. With rolling-pin, roll first half into 7 inch circle. Put scones 1 inch apart on greased baking sheet. Pierce with tines of a fork and brush tops with another 1/4 cup of maple syrup. 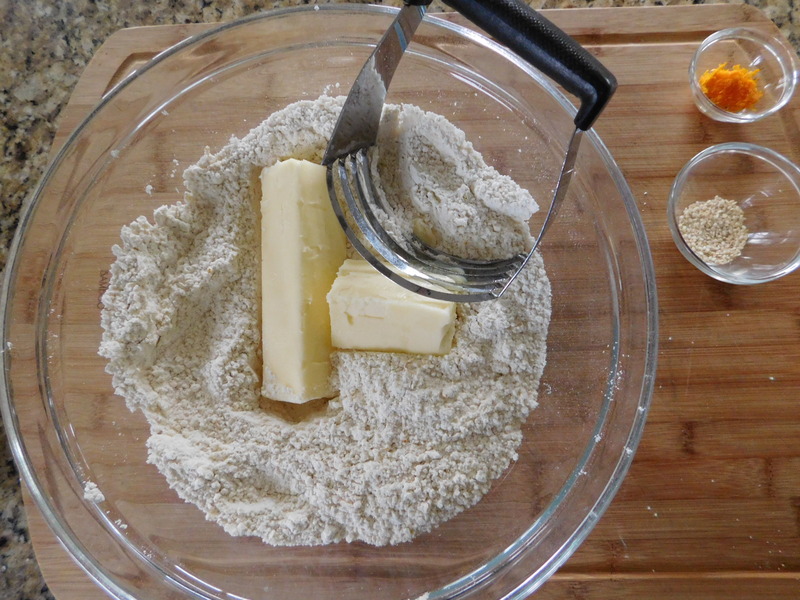 Mix up the wet and dry ingredients separately, then cut the butter into the dry ingredients. Add the wet ingredients and mix together with a fork. 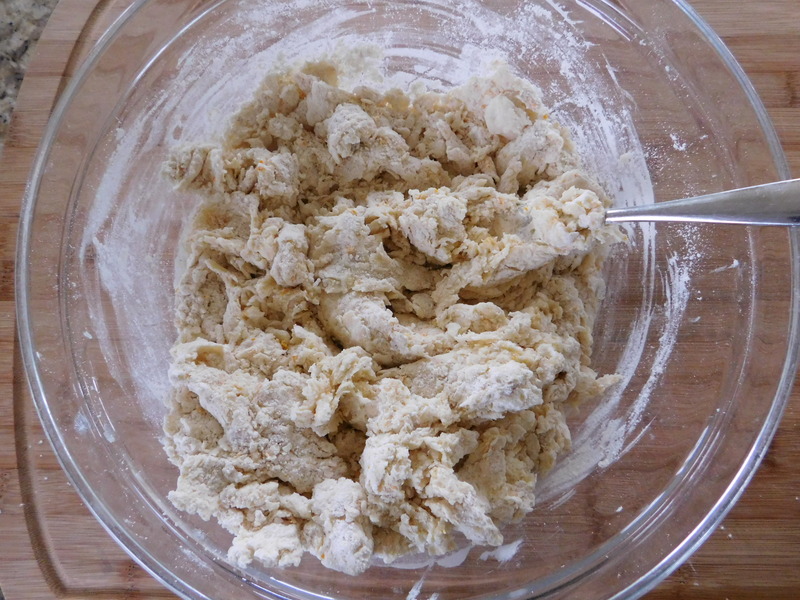 When you turn the dough out to knead, it will look like this and you’ll think, “no way will this work”. Knead a couple of times and it comes together nicely. Really, it will. 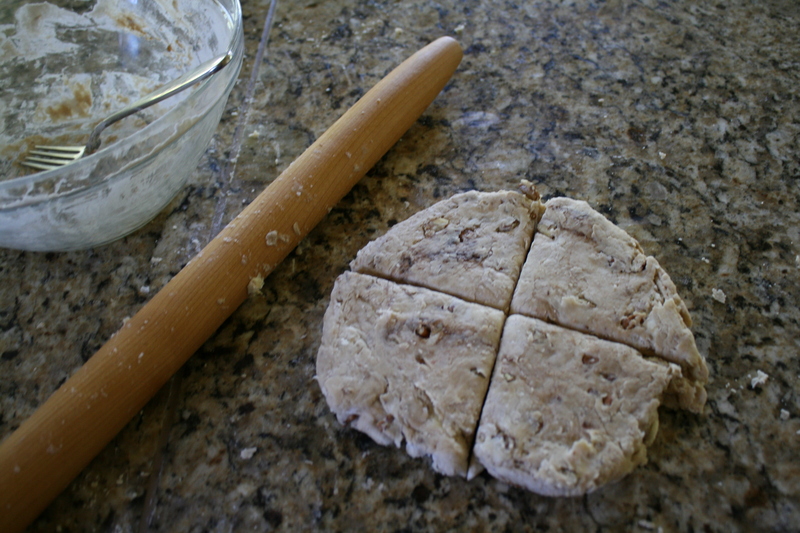 Divide the dough in two pieces and then roll them out into a 7″ circle. Cut the circle in 4 and put the pieces onto a baking sheet. Prick with a fork and brush with the remaining 1/4 cup of maple syrup. Ready for the oven. They come out of the oven full of sweet maple syrup and toasted pecans. Oh my. I’m so glad I tried this one. These are perfect for breakfast or afternoon coffee or tea. Serve them warm from the oven with some softened butter – oh wow. So good! 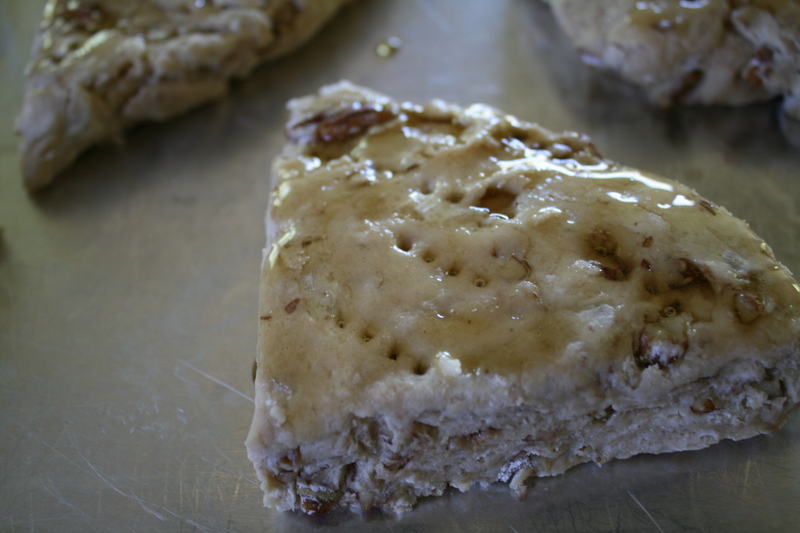 You might even want to think about serving these Maple Pecan Scones for that special breakfast on the third Thursday of November. 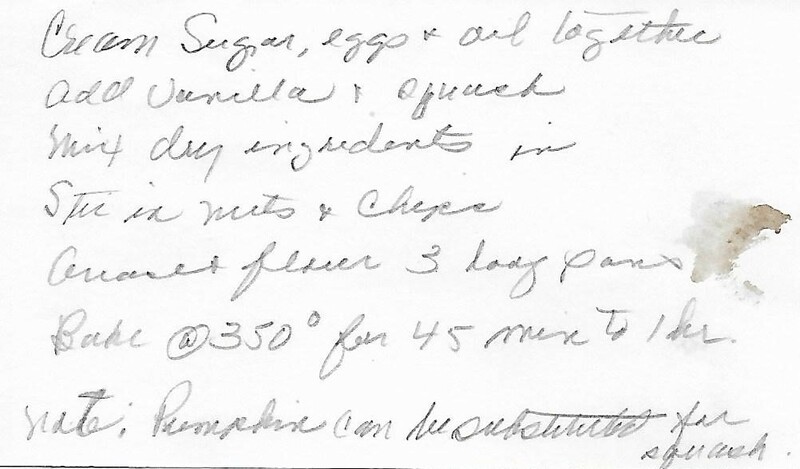 Today’s recipe for Cheese Muffins comes from my mother-in-law. I’m not sure where she got the recipe – maybe from one of HER old church cookbooks, but she raised a family of 6 kids, had a career as a nurse, and is now 93 years old and still making these. She made these muffins for us once when we visited her years ago, and we’ve been having them ever since. They’re good for this time of year when we’re all eating a lot of soups and chilis. They’d go perfectly with Chicken-Noodle Soup with Vegetables, Potato Soup, Cream of Broccoli Soup, 10 Minute Tomato Soup, or Creamy Vegetable Soup. The weather has been beautiful, but it’s getting cold here in Minnesota, and soup is perfect for coming into the warm house after you’ve been outdoors raking leaves, or stacking firewood, or even just going for a walk on a cool afternoon. We have to get outside while we can – winter IS coming, whether we like it or not. Soup is “good for ails ya”, as the old timers say, and what goes great with soup? Muffins. Cheese Muffins, to be exact. Better yet, make up a batch and get them into the freezer for use later on when you just want to make up some soup and the muffins with it all ready to go without a lot of fuss. Perfect. 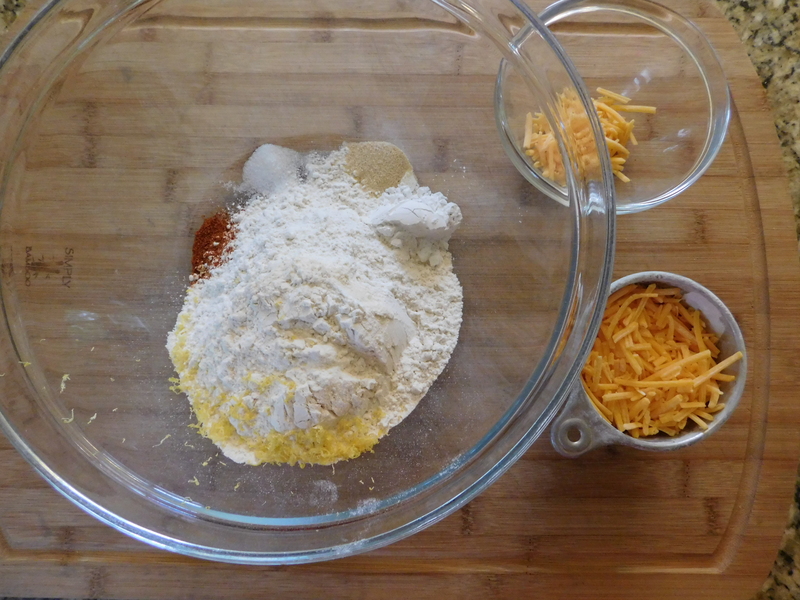 Combine rest of cheese with 1/2 teaspoon grated lemon peel and flour mixture. 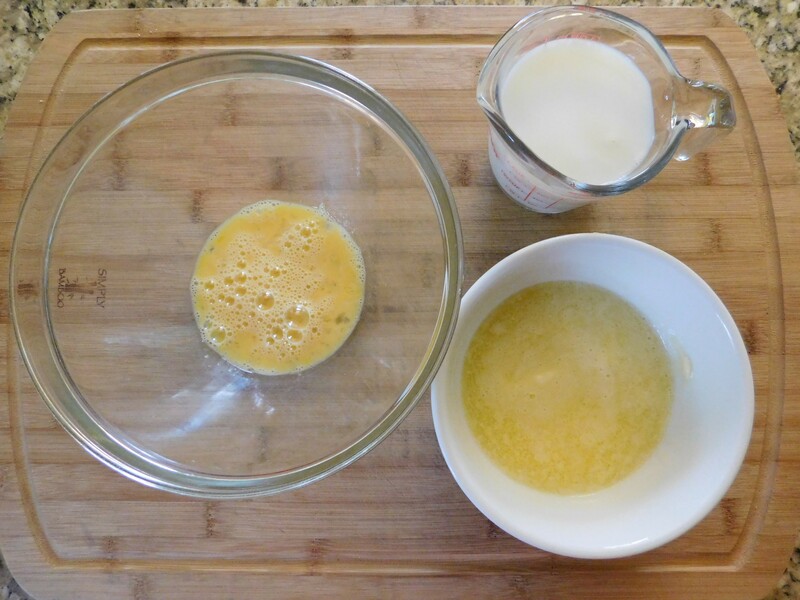 Pour all at once into dry ingredients, stirring just until moistened. 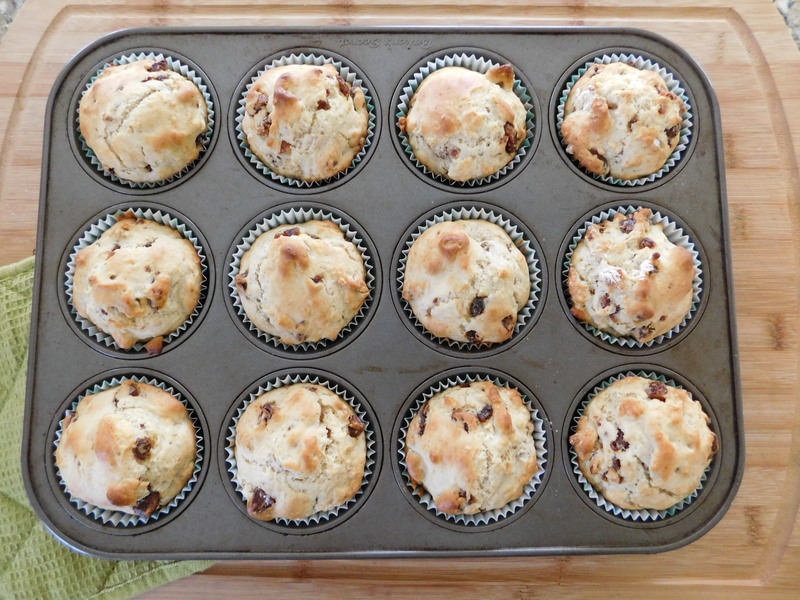 Divide equally into 9 greased 3″ muffin tins (I got 10 muffins). Sprinkle tops with reserved cheese. Here are the dry ingredients, all ready to go. Next are the wet ingredients, all ready to go. The ingredients are mixed up and ready to combine. It makes a stiff batter. 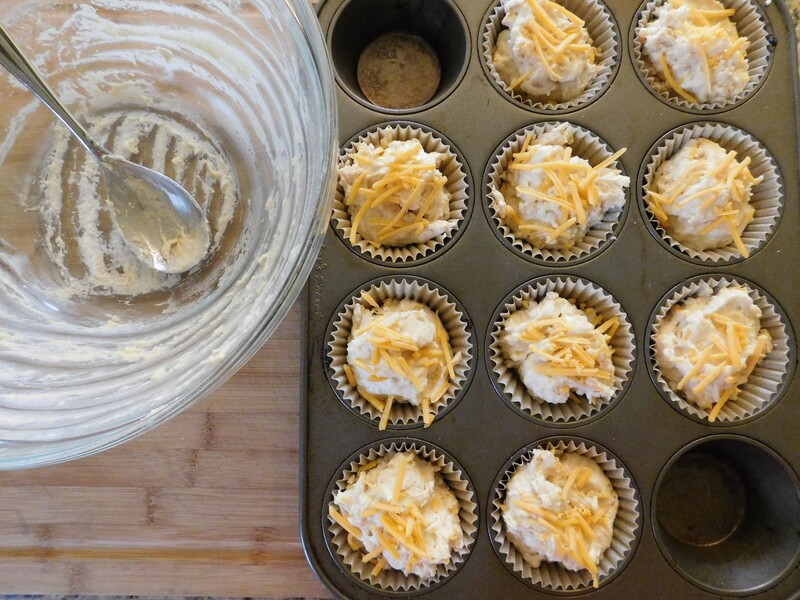 Into the muffin tins goes the batter and the reserved shredded cheddar is sprinkled on top. 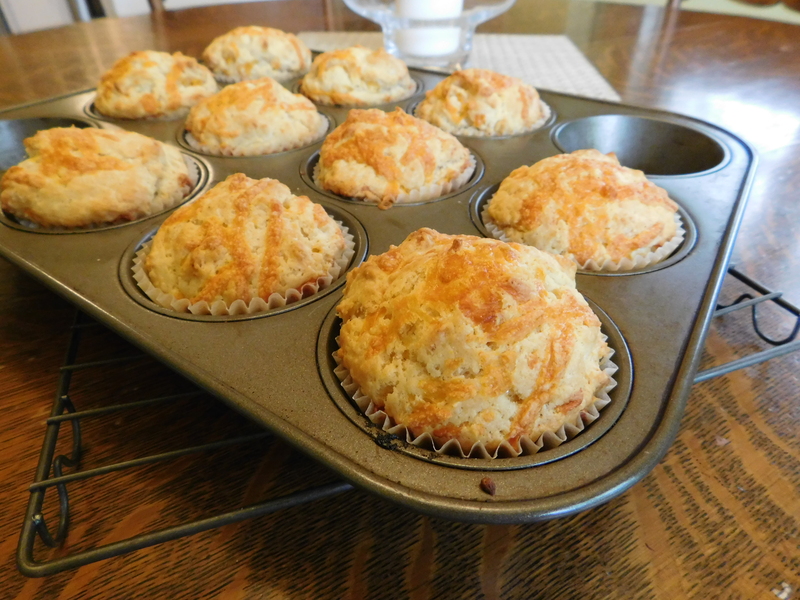 Out of the oven the muffins are fragrant with the cayenne and lemon, and the cheese is melted and sooooo good! Yes. I’d say these muffins are practically mandatory with a nice bowl of soup, like this Sweet Potato Corn Chowder. Just add some fruit or a nice green salad, and you’ve got a wonderful, tasty, comforting weekend lunch or light dinner. Get a batch of these Cheese Muffins into your freezer and you’re good to go for all the cold weather to come! 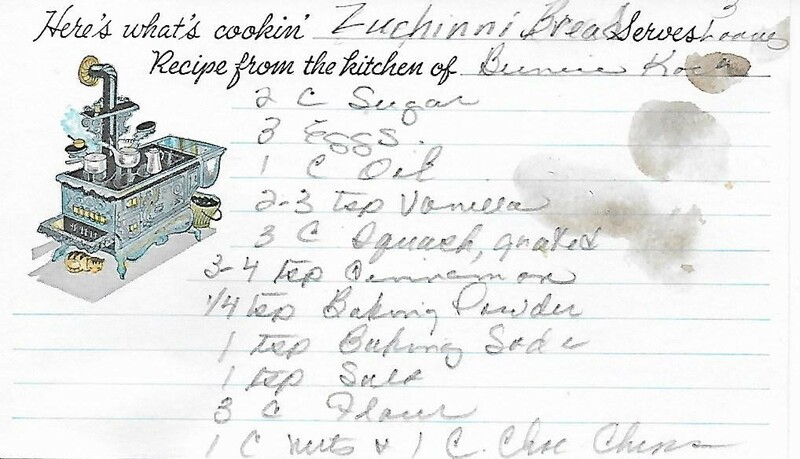 This recipe for Zucchini Bread is very close to a recipe for Zucchini Bread that was in Grandma’s old church cookbook, so you know it’s good. 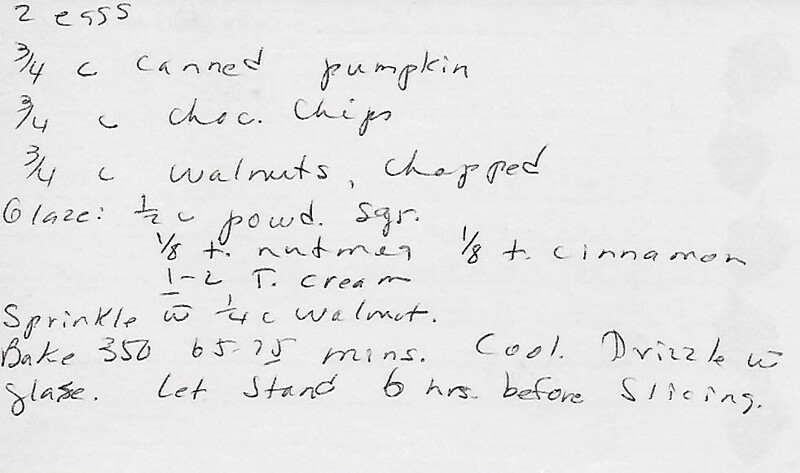 A friend of my mom’s gave her this recipe years ago, and I’m so glad she did. We made Zucchini Bread when I was growing up, and that original recipe has been lost, so I’m glad mom was able to get this one. Remember last week when I shared how to freeze zucchini? Well, this is another thing to do with it this winter when you have bags of zucchini in the freezer, waiting to be used in baked treats for your friends and family. We have a history of farming and gardening in our family. 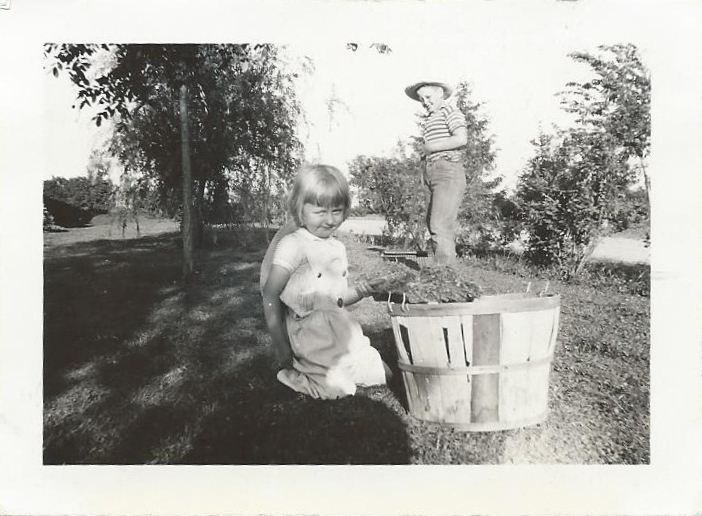 I had to share this photo of my mom when she was little – and she was in someone’s garden. I’m not sure what’s in that bushel basket, but it looks like they might have picked carrots. She’s quite the little farmer with her straw hat hanging down her back and the overalls she’s wearing. I’m not sure who’s farm it is, but it does look like she was on a farm, somewhere. I hope she (and that young farmer accompanying her) filled that bushel basket! So cute! Gardening was a necessity for Grandma and her family, and all families who survived The Great Depression in the 1930’s, but it’s not only fun, it’s economical! Grow your own veggies AND save money! Yep – gotta love that! It’s important to save every last speck of fruit and vegetable you grow, and preserve it for a later date, oh, say winter here in Minnesota, when nothing grows and you want/need some fresh or locally grown produce preferably from your own garden. So when you end up with a huge zeppelin of a zucchini hiding underneath the leaves of the zucchini plant in your garden, you don’t want to waste it. Squeal with glee (not that I know anything about that or anything), pick said zeppelin, heft it into the kitchen (cuz that sucker’s heavy), shred it, freeze it, and next winter turn it into delicious baked treats for your friends and family. 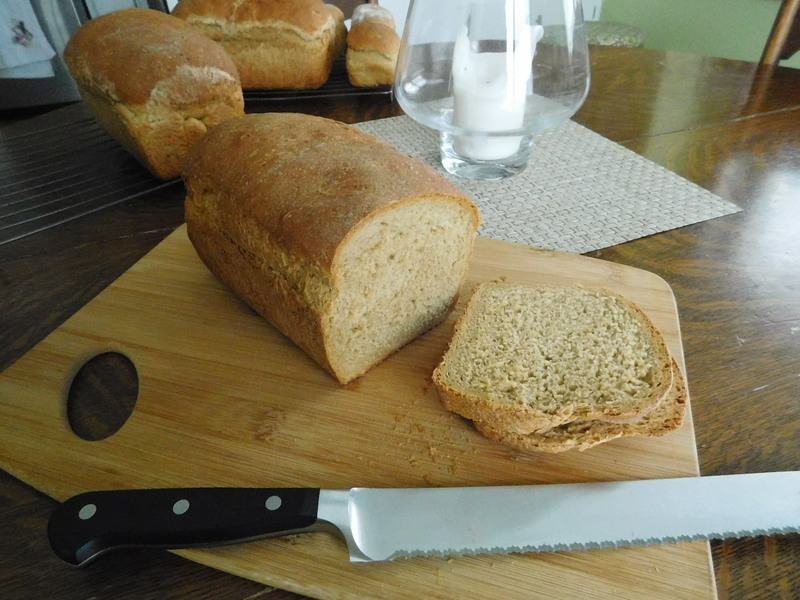 Another plus – this recipe makes 3 loaves! 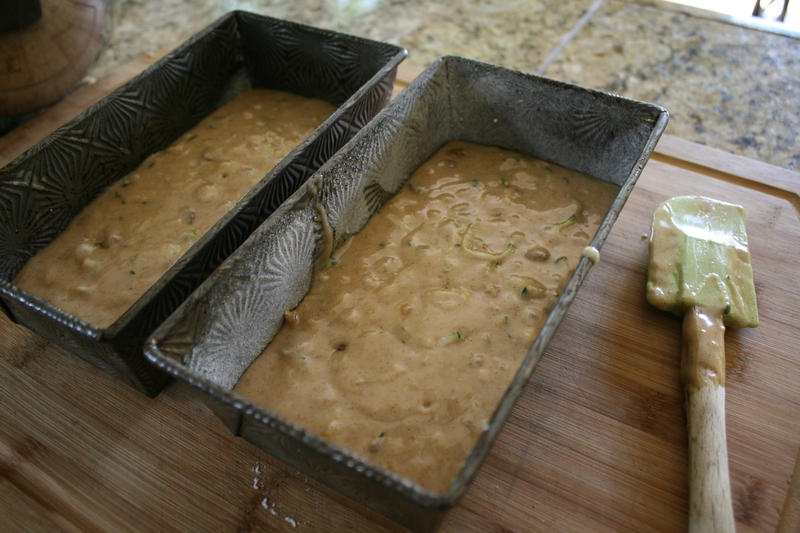 Pour batter into 3 greased and floured loaf pans. Note: Pumpkin can be substituted for zucchini. I made two regular sized loaves and 3 small loaves perfect for gift-giving. 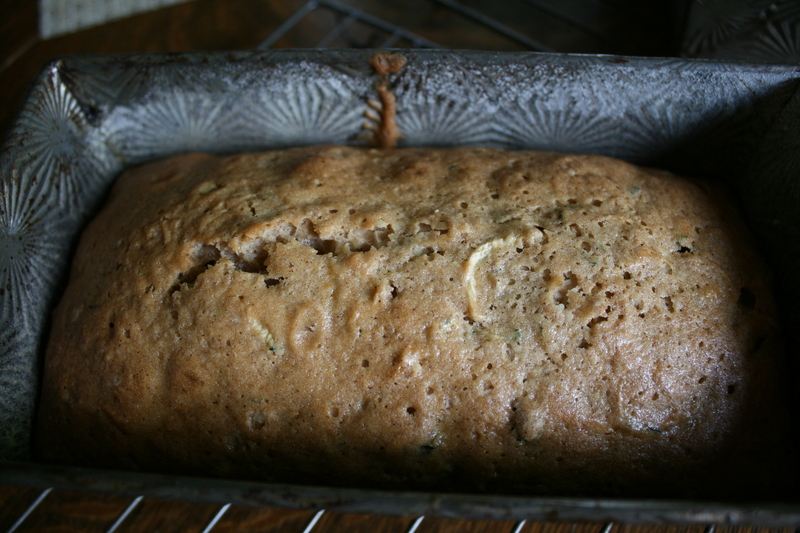 Oh boy – did this smell good while baking! The recipe says that pumpkin can be used instead of zucchini – I’ll have to try that, too! This bread is so delicious! Seriously. It’s perfect for breakfast, for an after-school snack, or for your afternoon coffee or tea. It’s full of fruit (or chocolate), nuts, and zucchini – and I mean it’s LOADED! Make a batch of this seriously delicious Zucchini Bread – eat a loaf, put a loaf in the freezer for later, and, well, maybe just eat two loaves.